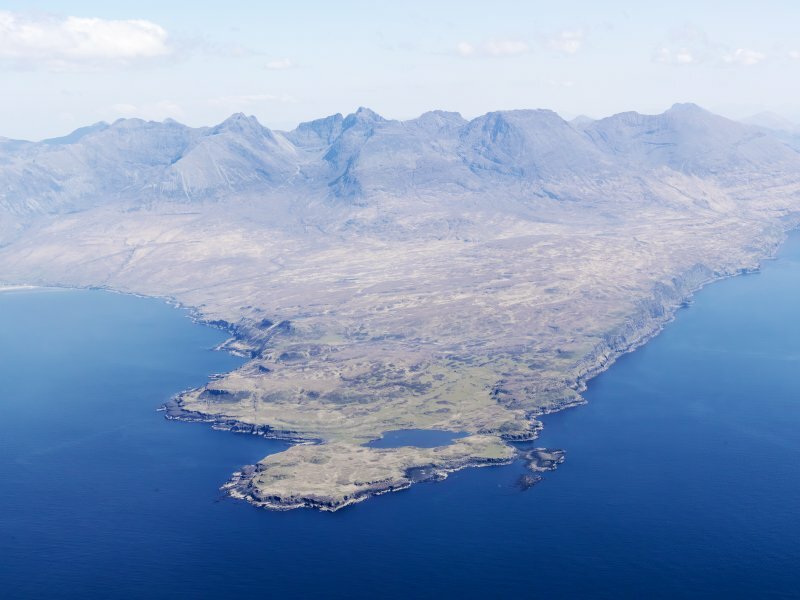 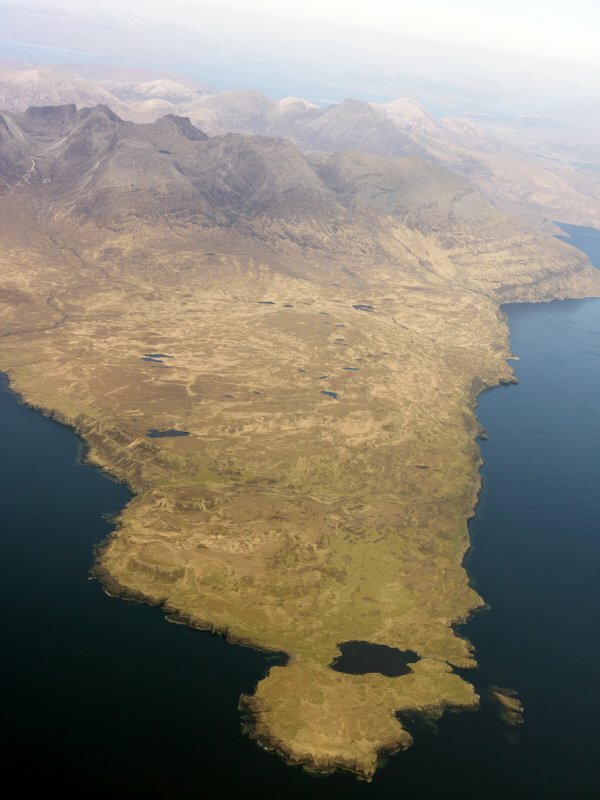 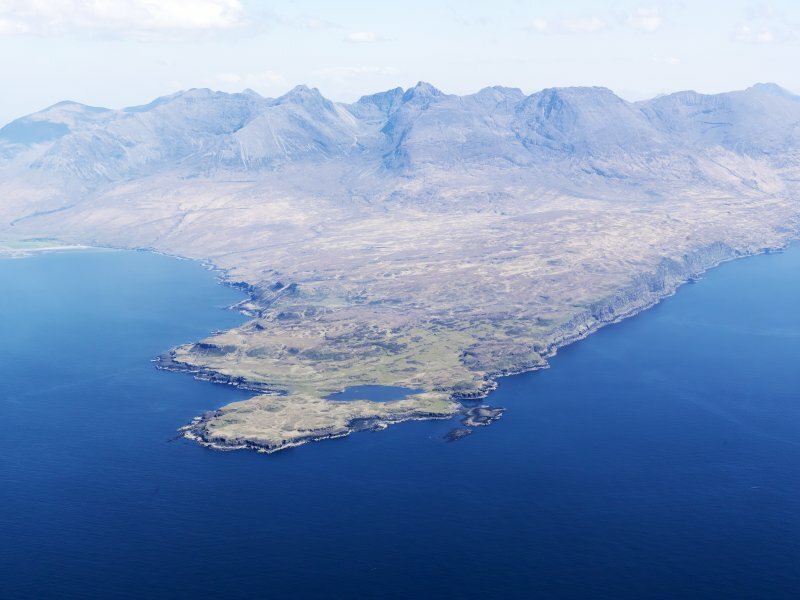 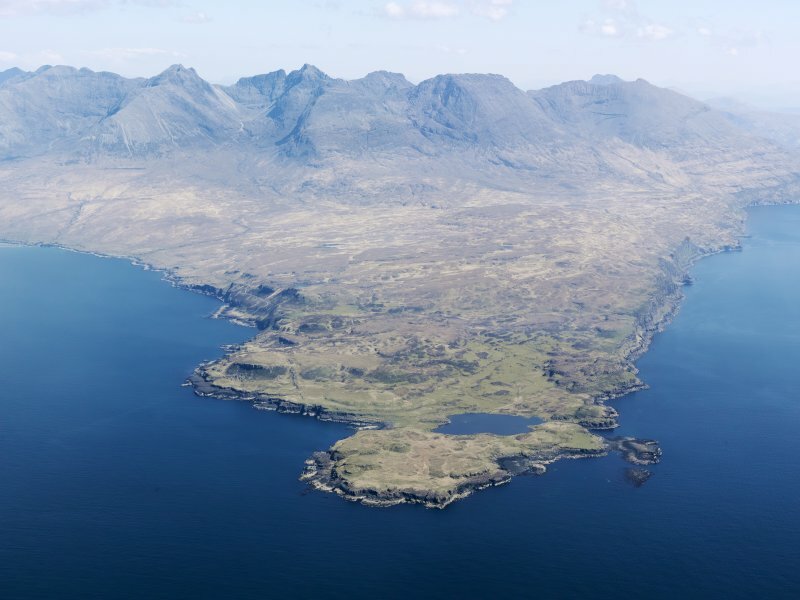 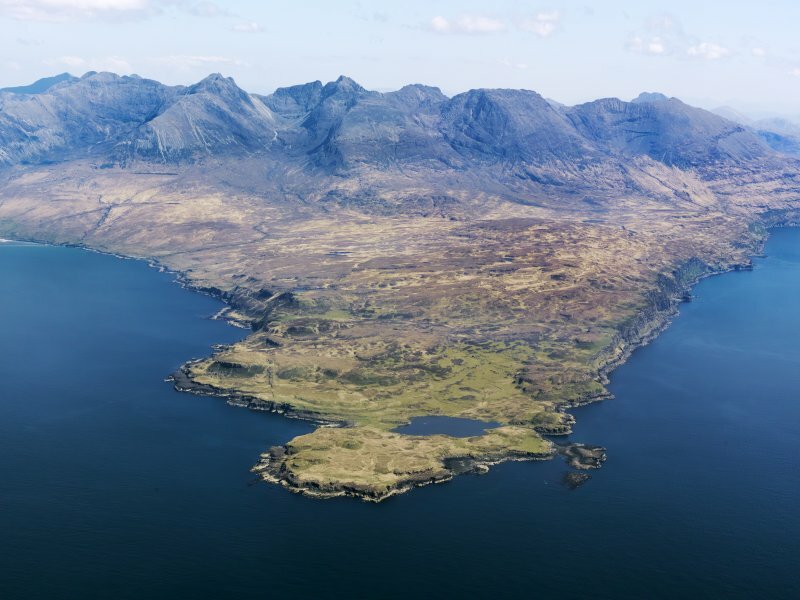 General oblique aerial view centred on Loch na h-Airde, the 'Viking Canal’ and Rubh' an Dunain with the Cuillin Hills in the background, taken from the WSW. 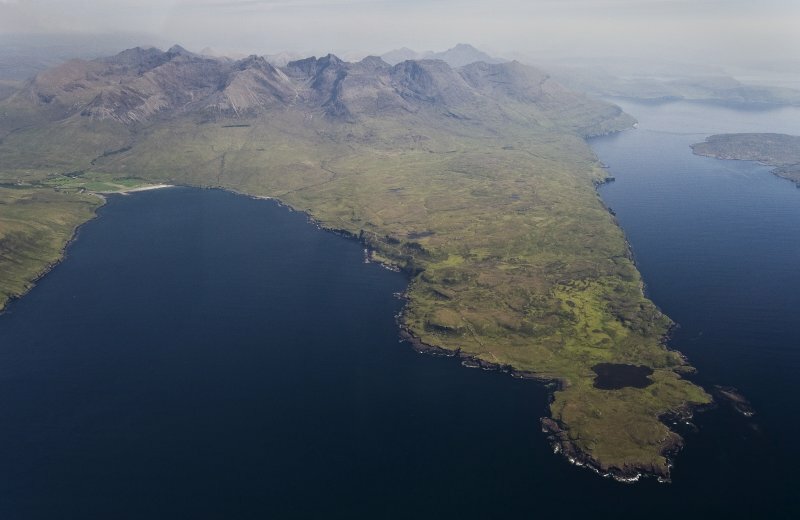 General oblique aerial view of the remains of the harbour at Rubh' an Dunain, looking towards the Cuillins, Isle of Skye, taken from the WSW. 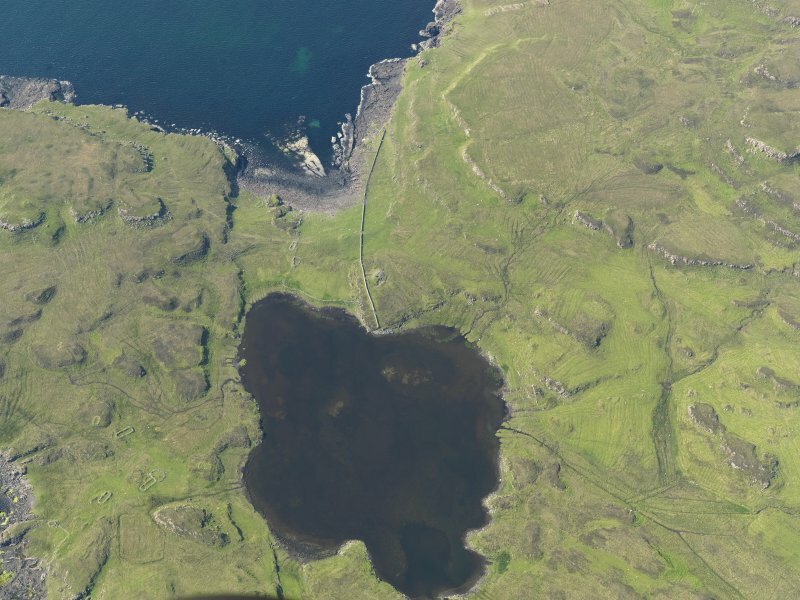 General oblique aerial view centred on the harbour at Loch na h-Airde, the 'Viking Canal’ and Rubh' an Dunain, looking WSW. 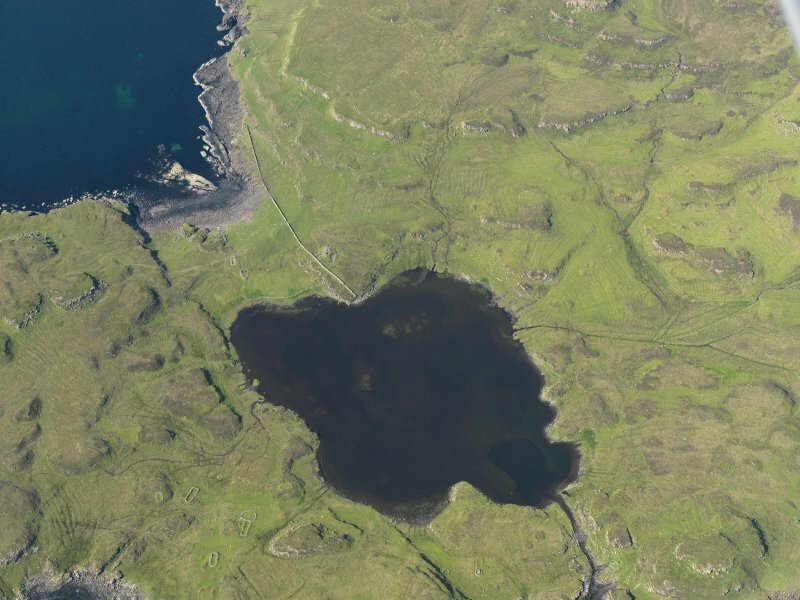 General oblique aerial view centred on Loch na h-Airde, the 'Viking Canal’ and the remains of the dun at Rubh' an Dunain, taken from the WNW. 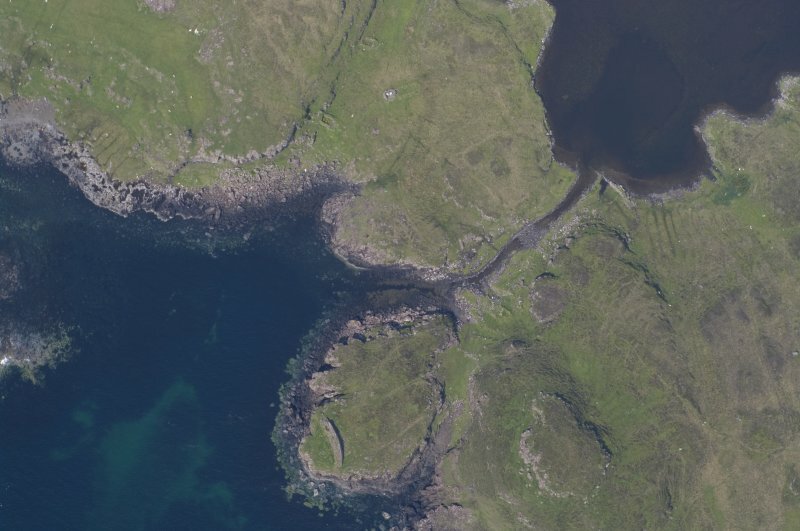 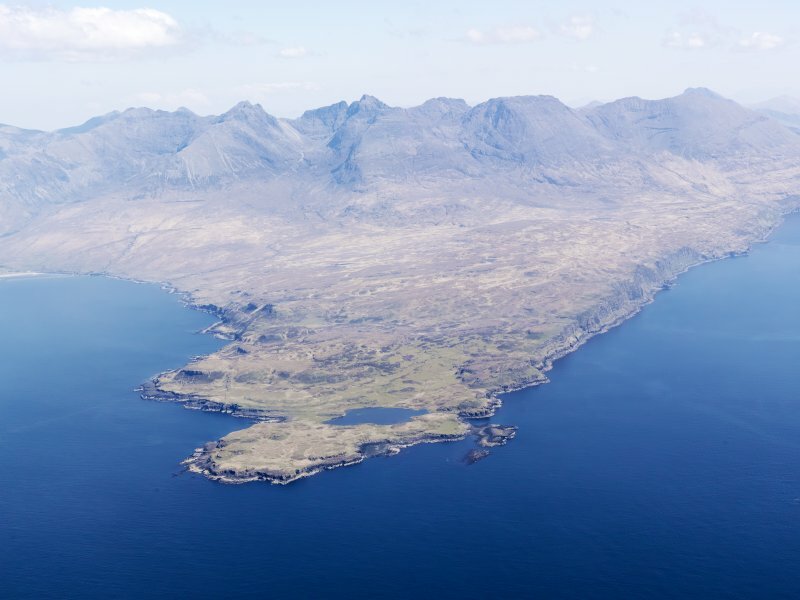 Oblique aerial view of the remains of the township, harbour and cultivation remains at Rubh' an Dunain, Isle of Skye, taken from the S.
General oblique aerial view centred on Loch na h-Airde, the 'Viking Canal’ and Rubh' an Dunain with the Cuillin Hills in the background, taken from the SW.
Oblique aerial view centred on Loch na h-Airde, the 'Viking Canal’ and Rubh' an Dunain, taken from the E.
Oblique aerial view centred on Loch na h-Airde, the 'Viking Canal’ and the remains of the dun at Rubh' an Dunain, taken from the S.
Oblique aerial view centred on Loch na h-Airde, the 'Viking Canal’ and the remains of the dun at Rubh' an Dunain, taken from the E.
Oblique aerial view centred on Loch na h-Airde, the 'Viking Canal’ and Rubh' an Dunain, taken from the WNW. 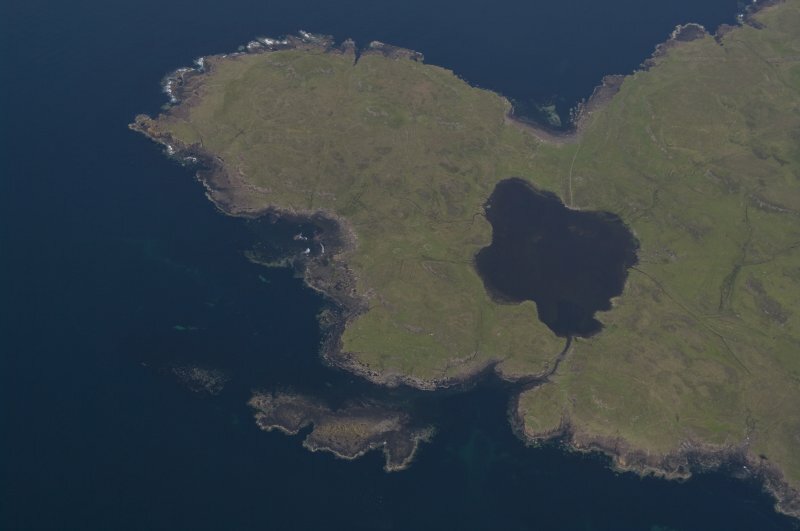 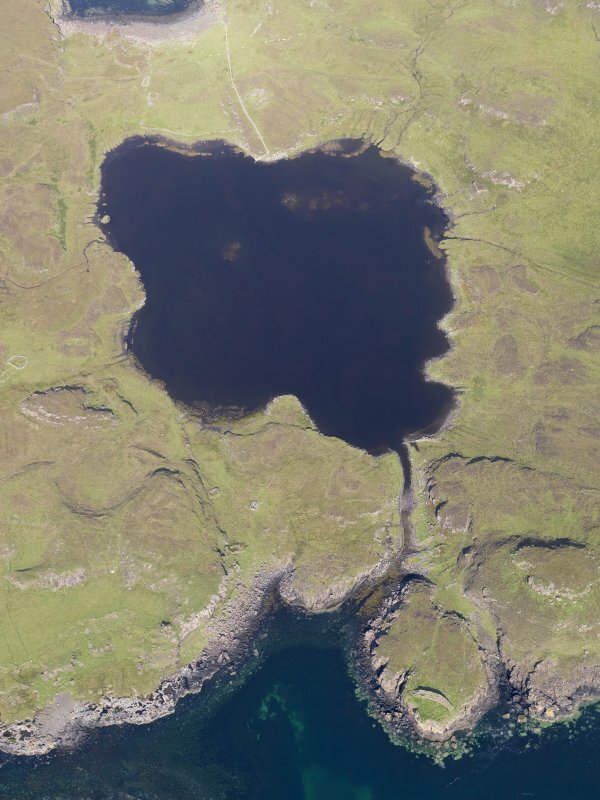 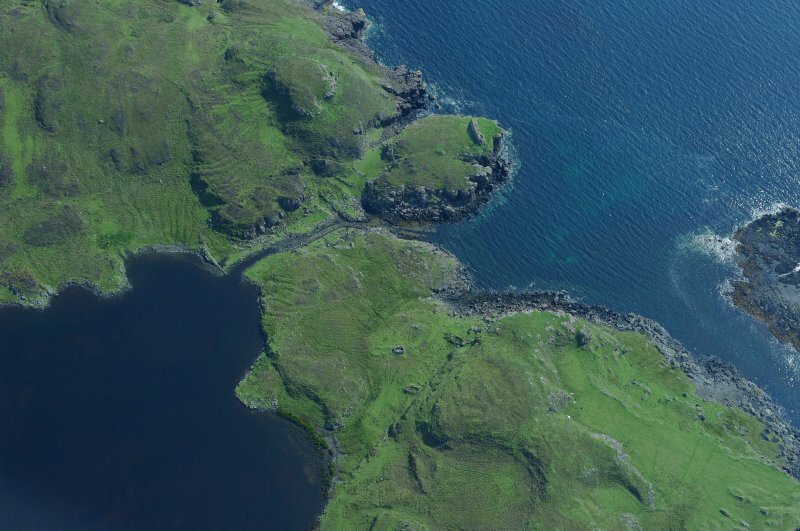 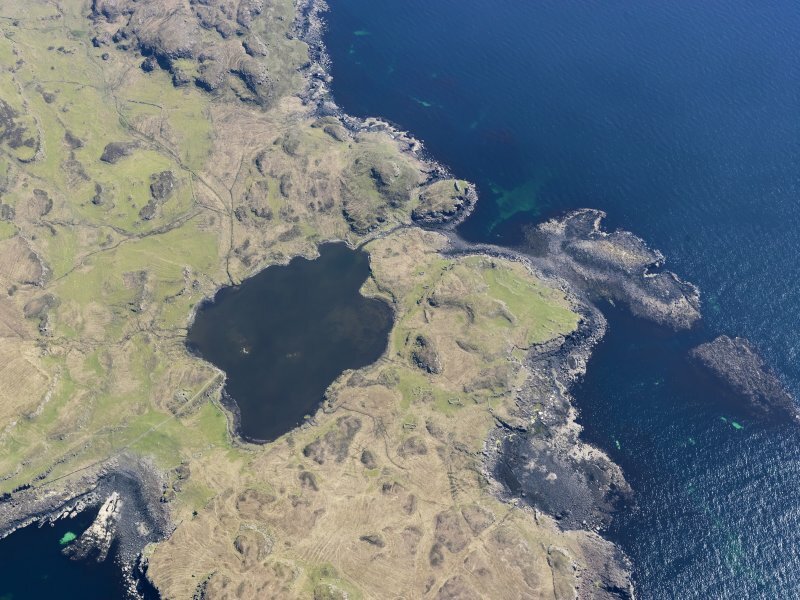 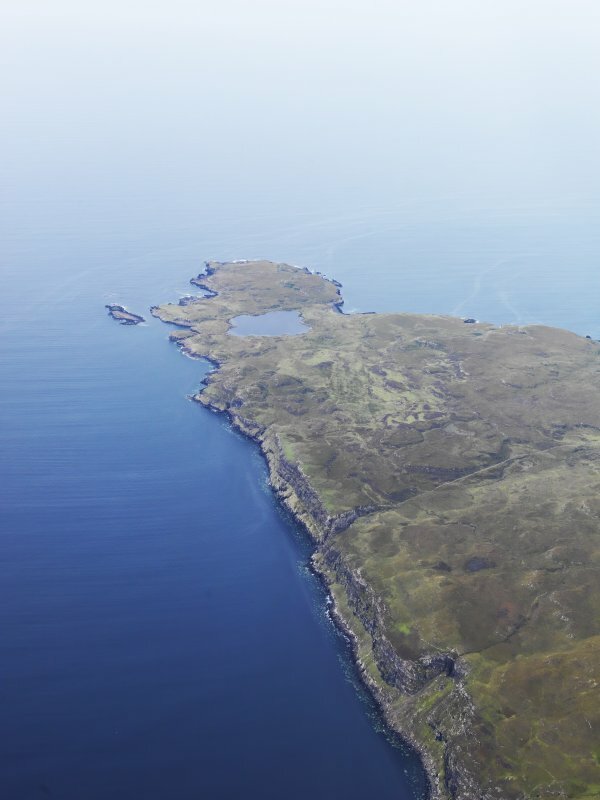 Oblique aerial view centred on Loch na h-Airde, taken from the SSE. 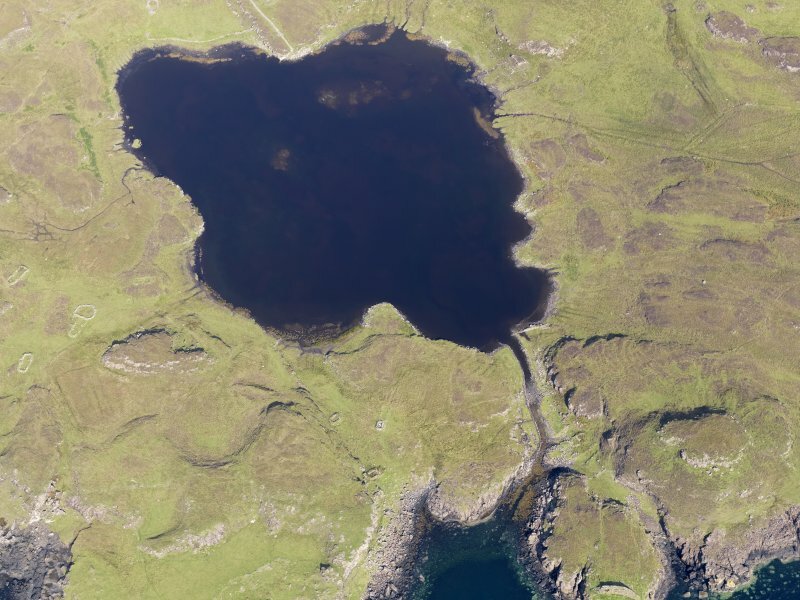 Oblique aerial view centred on Loch na h-Airde, the 'Viking Canal’ and Rubh' an Dunain, taken from the SW.
Oblique aerial view centred on Loch na h-Airde, taken from the ENE. 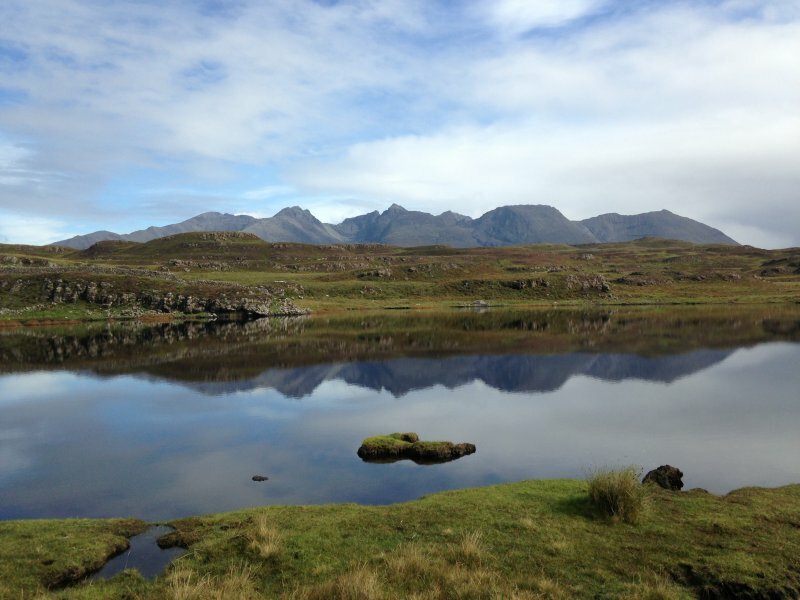 General shot from Loch na h-Airde to the Cuillin. 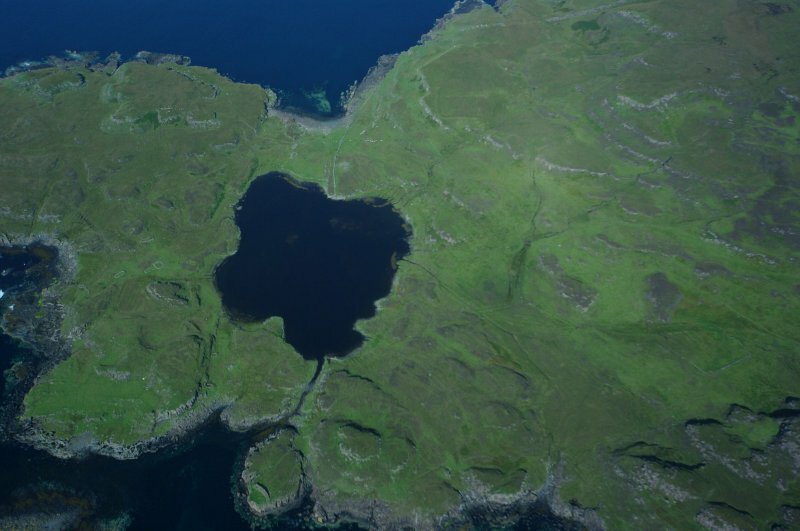 Oblique aerial view centred on Loch na h-Airde, the 'Viking Canal’ and Rubh' an Dunain, taken from the SSW. 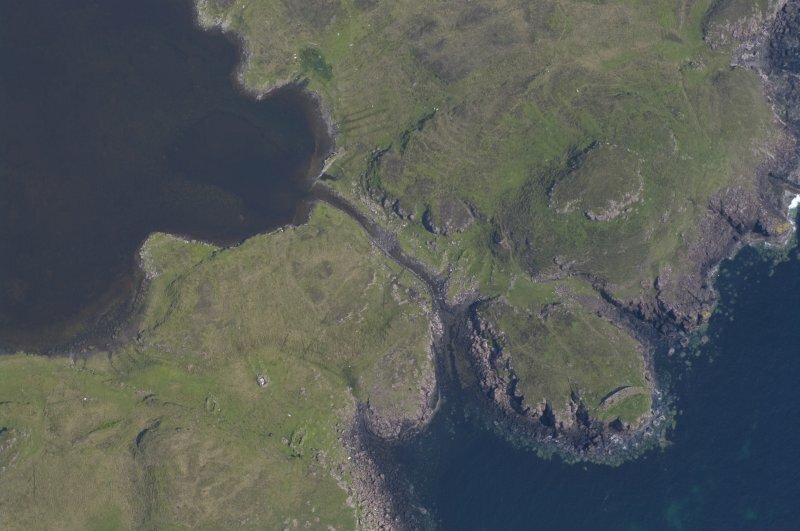 Oblique aerial view centred on the harbour at Loch na h-Airde, the 'Viking Canal’ and Rubh' an Dunain, taken from the S.
Loch na h-Airde from the settlement above Rubh’ an Dùnain, looking SW.
General oblique aerial view of the remains of the harbour at Rubh' an Dunain, looking towards the Cuillins, Isle of Skye, taken from the W.
Oblique aerial view centred on Loch na h-Airde, the 'Viking Canal’ and Rubh' an Dunain, taken from the SE. 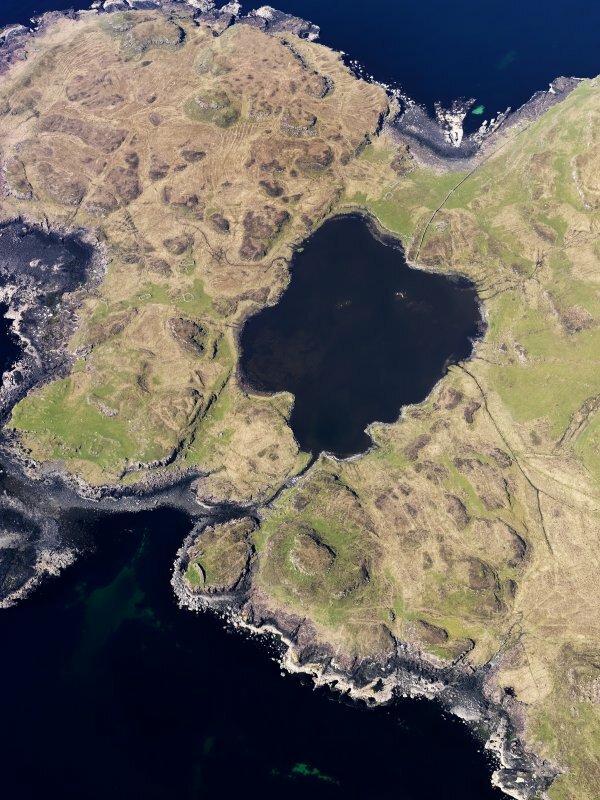 Oblique aerial view centred on Loch na h-Airde, the 'Viking Canal’ and Rubh' an Dunain, taken from the W.
Oblique aerial view centred on Loch na h-Airde, the 'Viking Canal’ and the remains of the dun at Rubh' an Dunain, taken from the SSW. 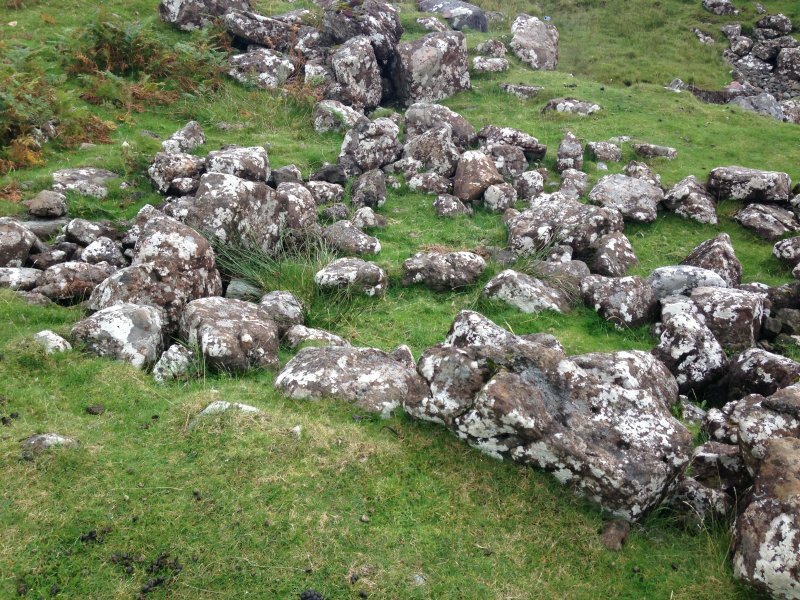 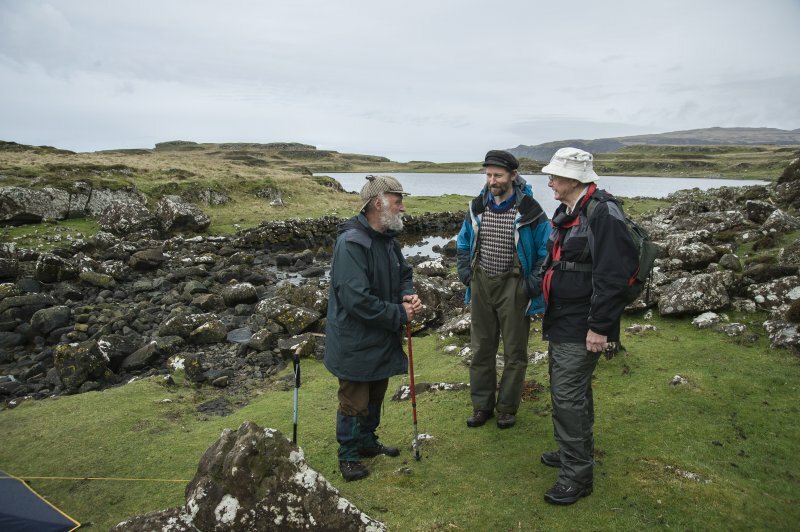 At the toe of this remote promontory, bounded by Loch Brittle and the Sound of Soay and reached only by a lonely track, lies a rich palimpsest of archaeological remains testifying to the former significance of Rubh' an Dunain. 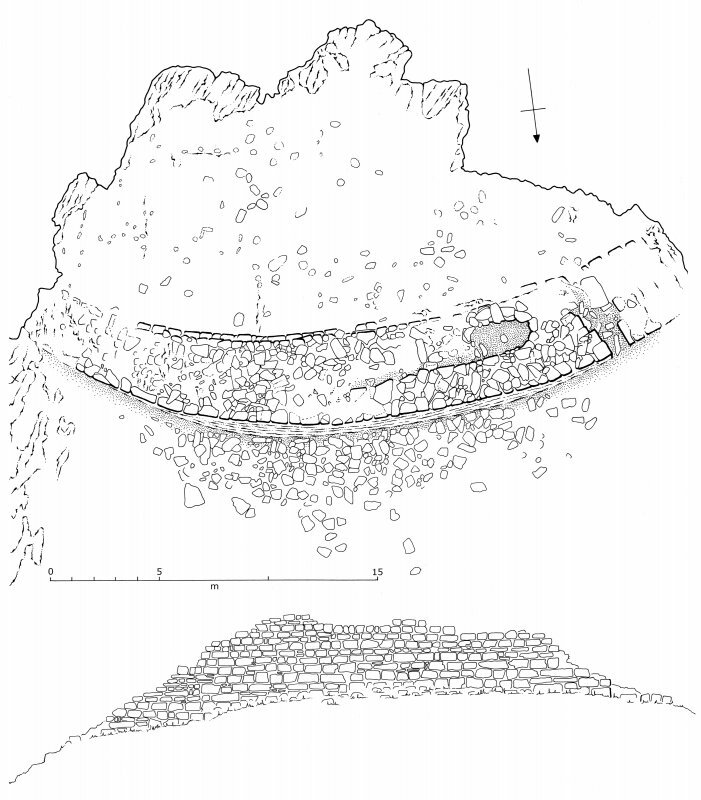 Chambered cairn, probably 2nd or 3rd millennium bc, a Neolithic passage grave. 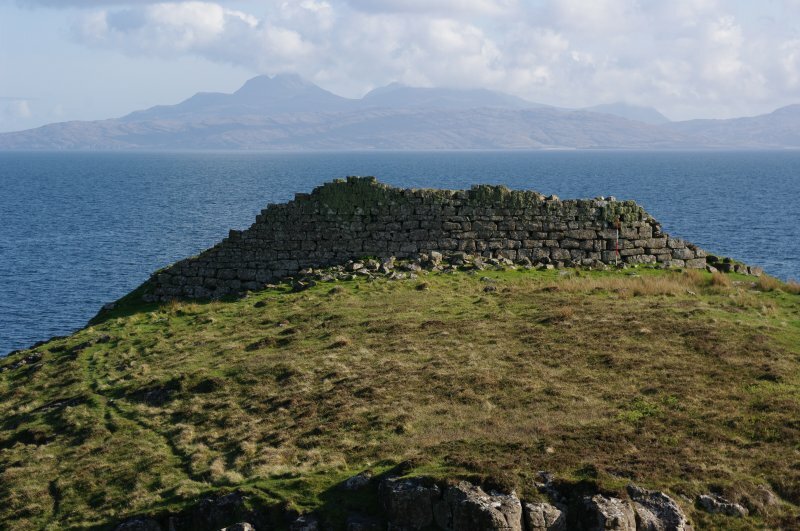 To its south, one of best preserved survivals of an Iron Age promontory fort (or galleried dun), with a portion of curved drystone wall to landward, possibly 1st millennium bc. 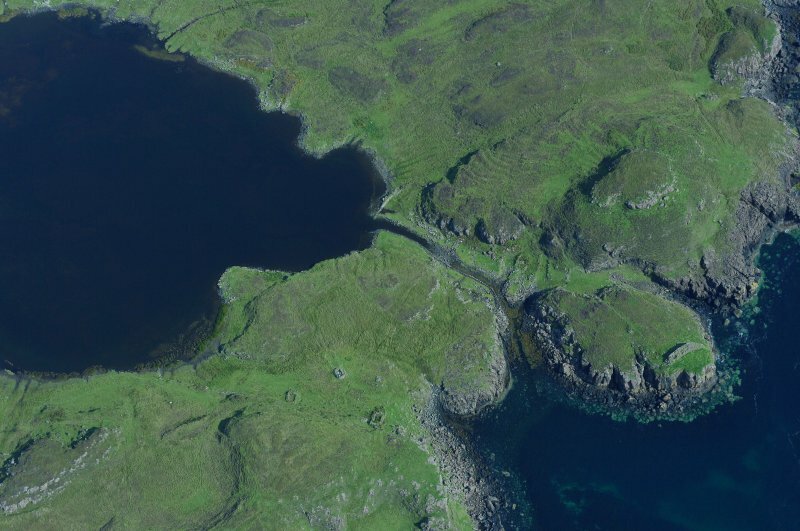 A stone-lined canal, possibly Viking, connects a sheltered inlet to a small lochan, suitable for harbouring birlinns. 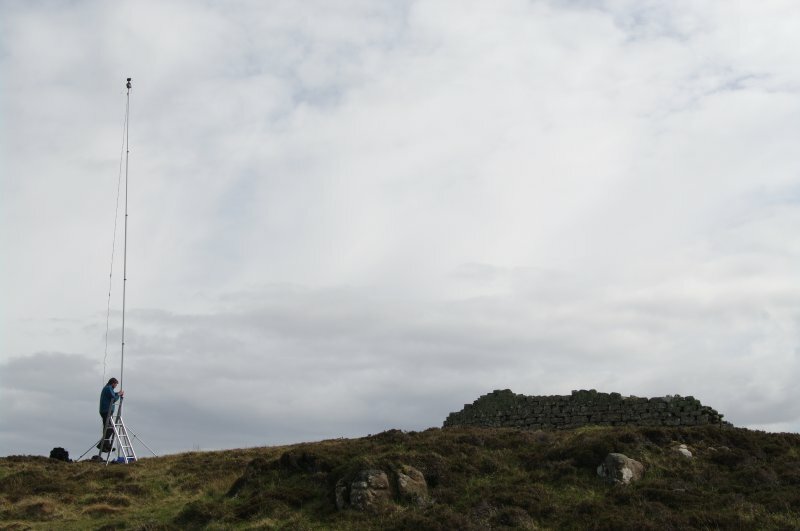 Small former township, with round-ended ruin of early-mid 18th century tacksman's house, a two-storey chimney gable at one end. 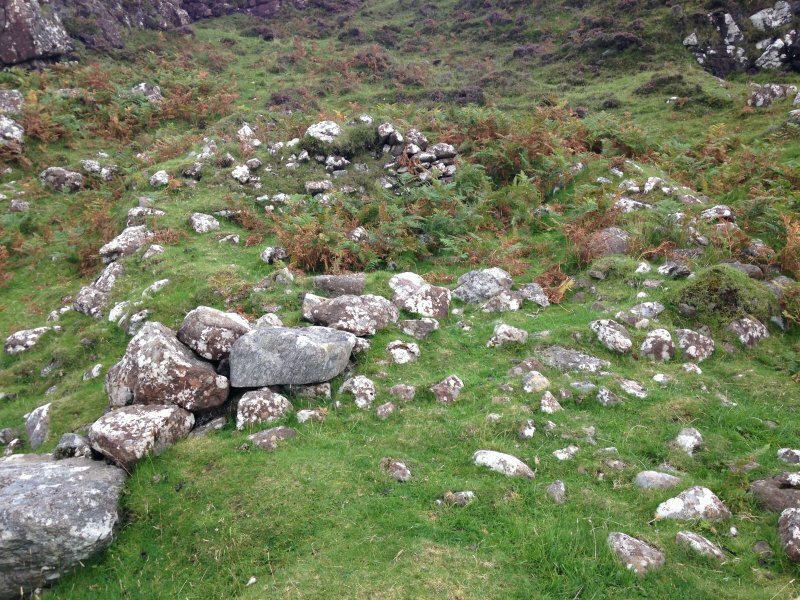 Still occupied in the 1860s, this was the home of the MacAskills of Rubh' an Dunain. 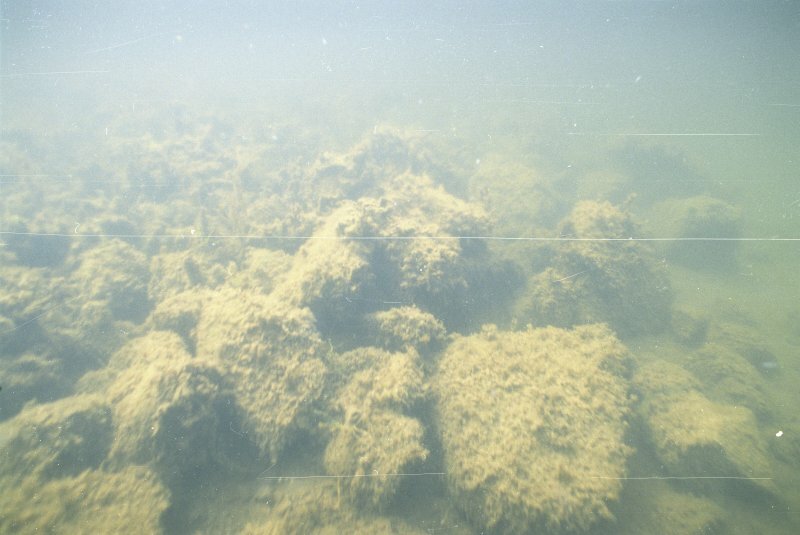 On the side of the 'canal' there are what appear to be two substantial boat noosts. 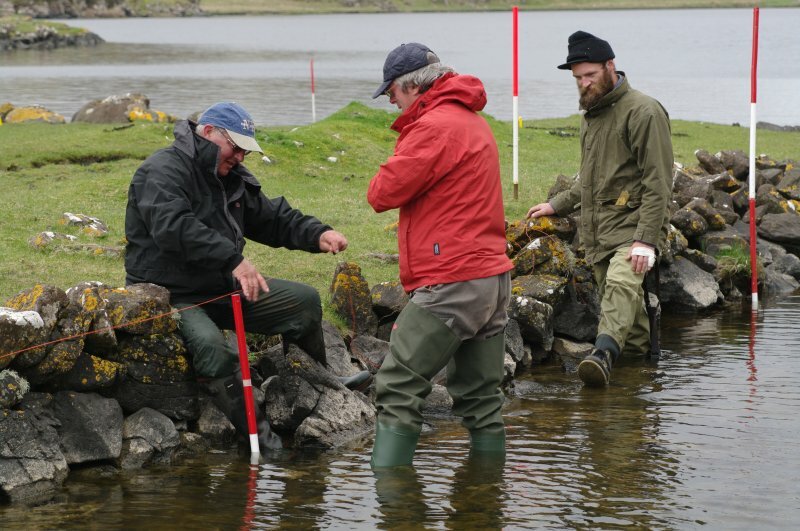 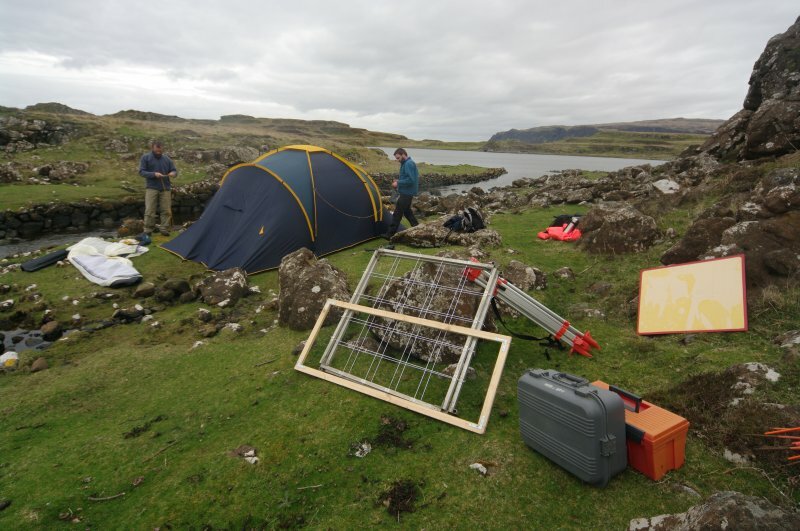 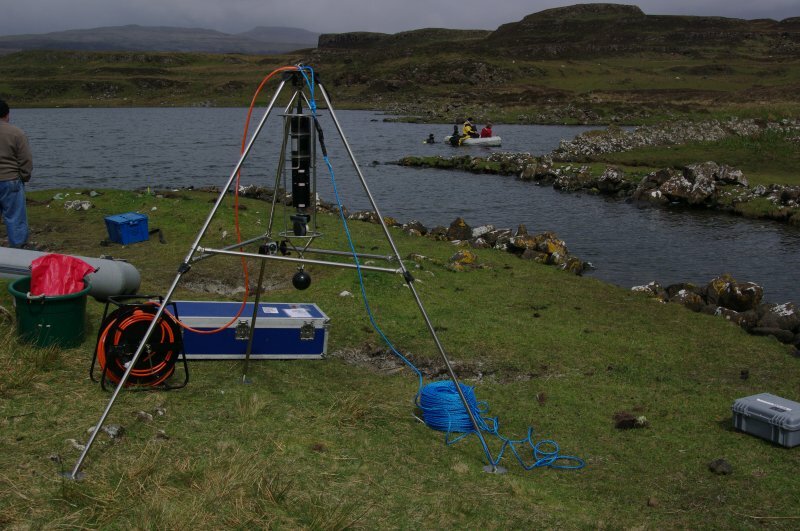 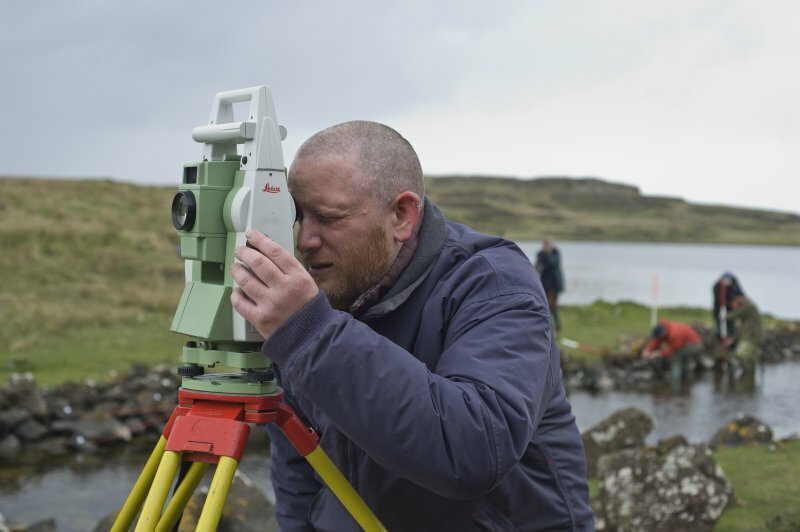 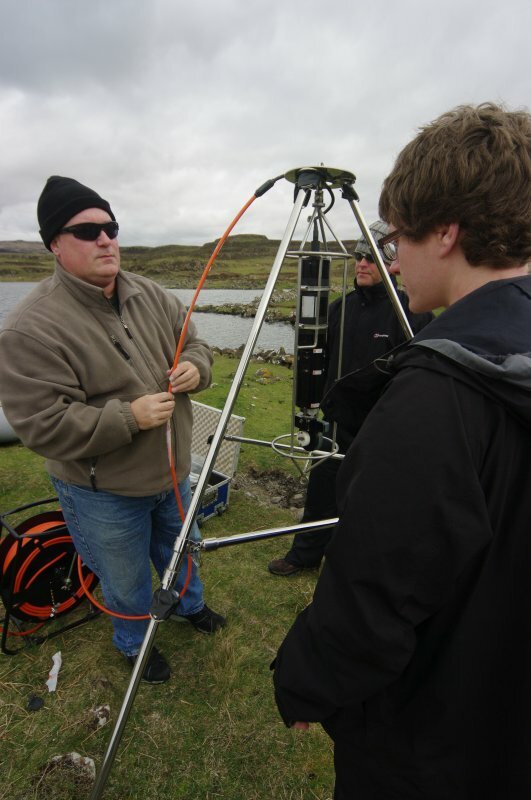 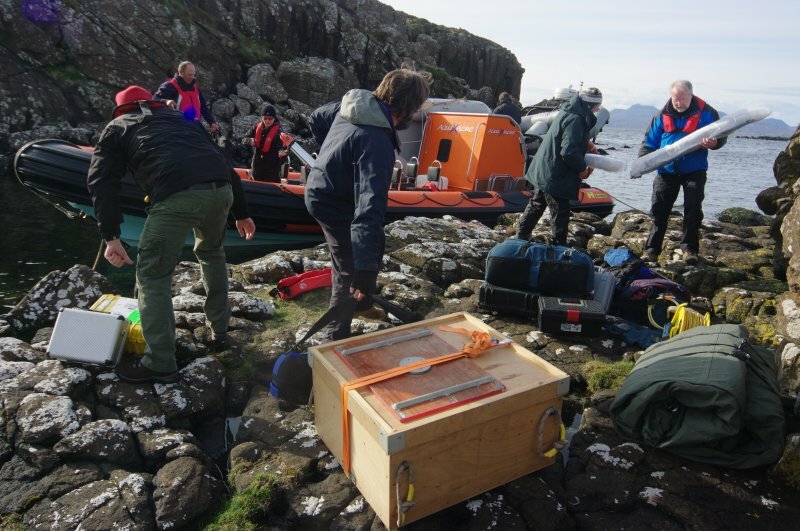 There is no indication as to the origins of the canal or the purpose of the combined loch and canal, or their relationship with the dun (NG31NE 1), but future sampling and survey underwater in the loch may help to clarify the situation. 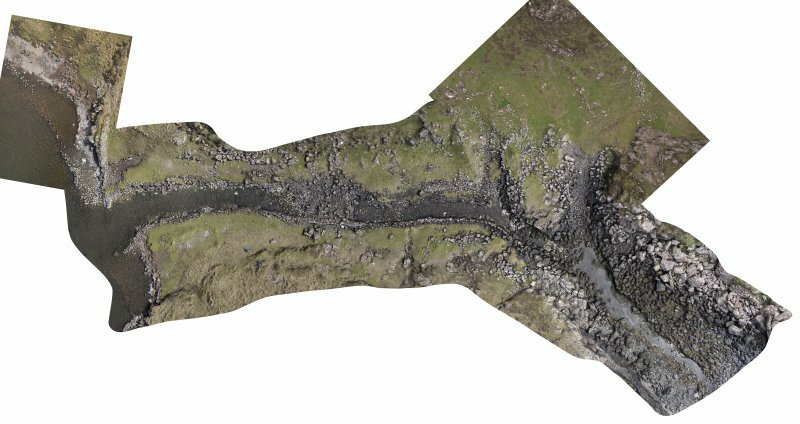 A single unroofed building is depicted on the 1st edition of the OS 6-inch map (Inverness-shire, Isle of Skye 1881, sheet xlix). 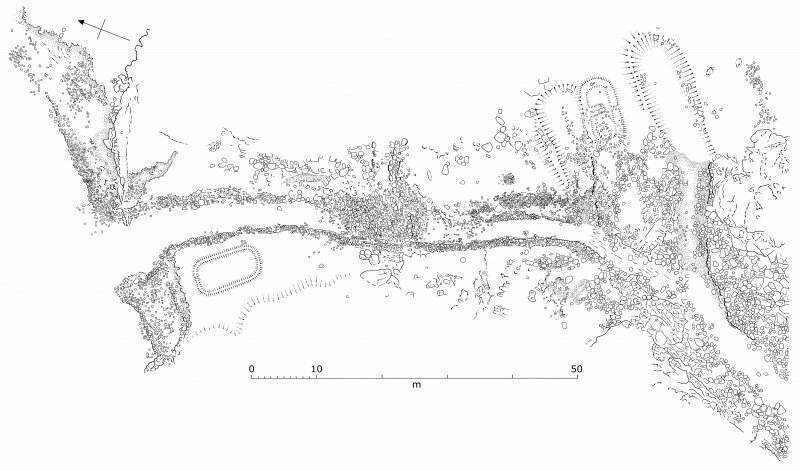 What may be the same unroofed building is shown on the current edition of the OS 1:10000 map (1986). 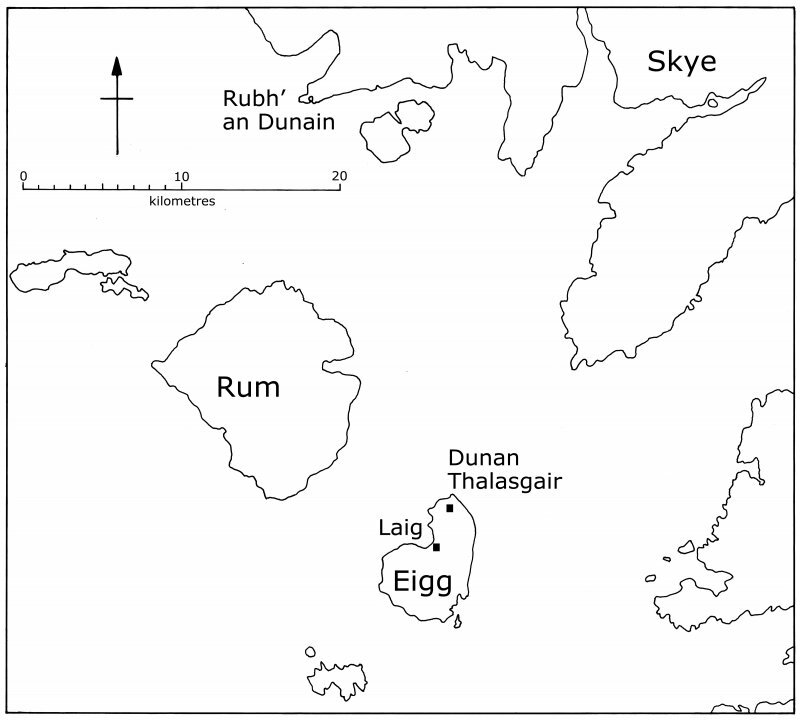 Information from RCAHMS (AKK), 14 November 1996. 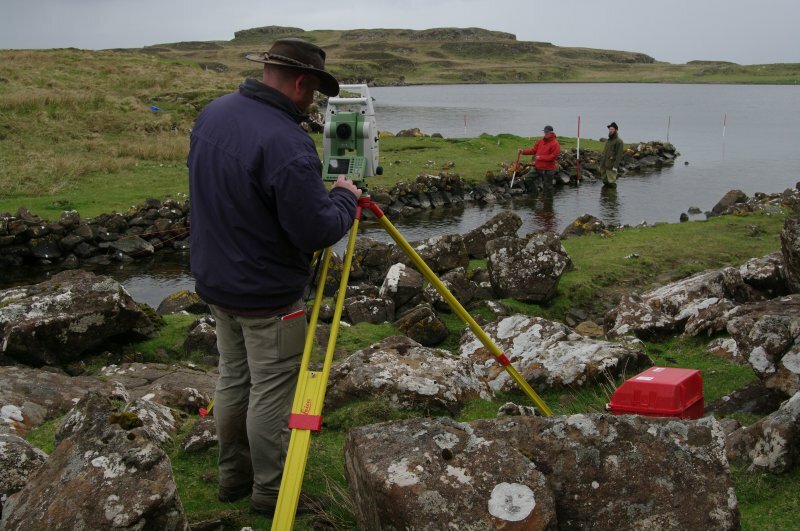 NG 394 162 (centred on) An assessment survey was conducted 23 April–9 May 2009 following the discovery of medieval boat timbers on the northern edge of Loch na h-Àirde in 2000 and 2008. 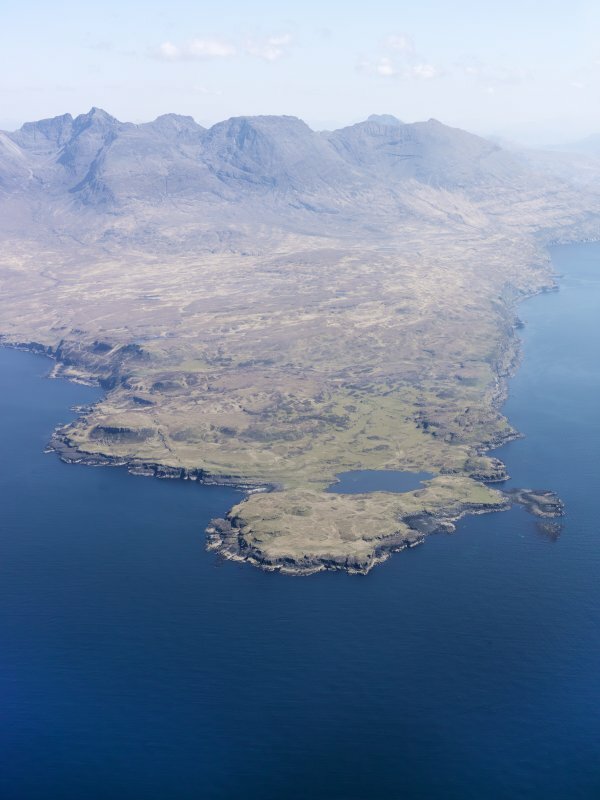 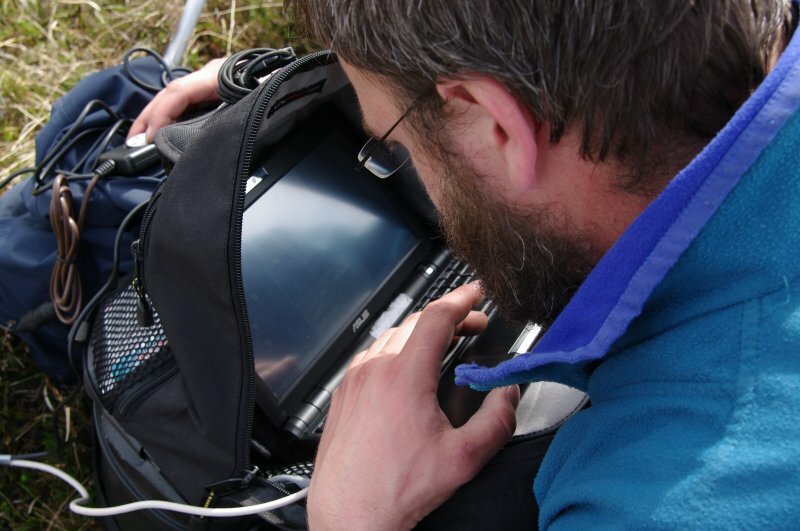 An aerial photography sortie facilitated by RCAHMS was conducted on 31 May 2009. 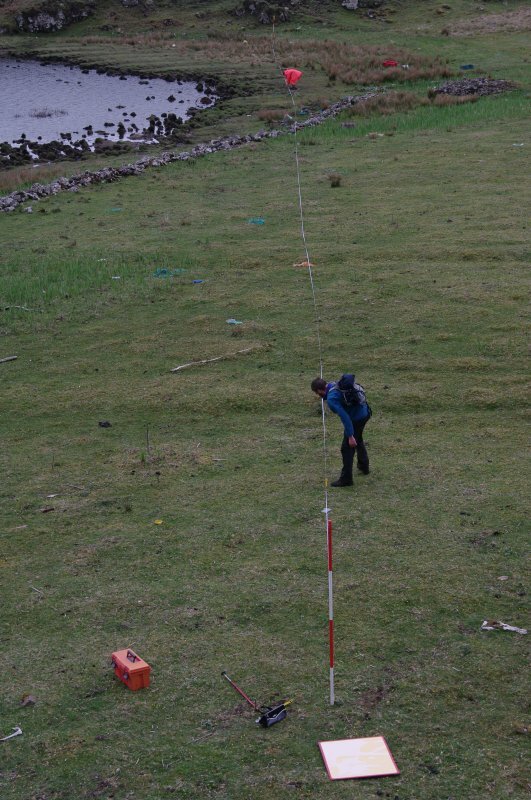 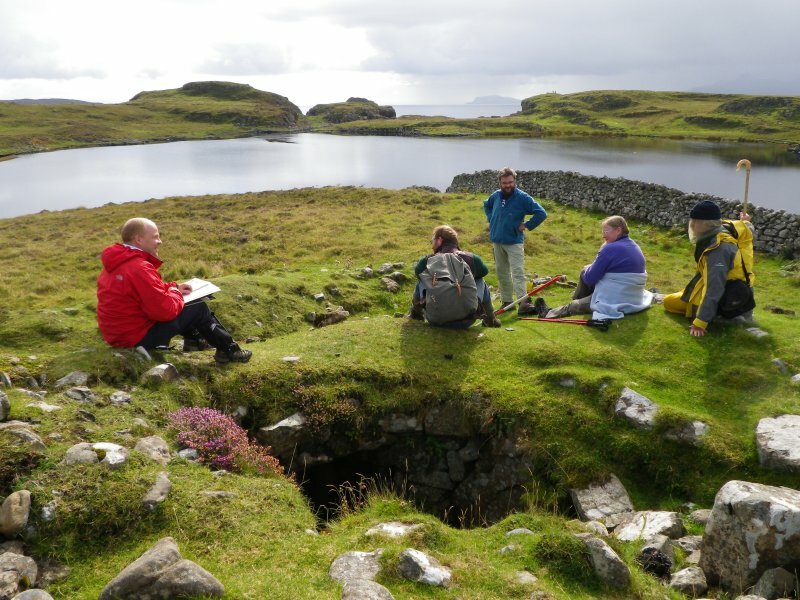 Detailed surveys were conducted on the partly artificial channel 100m long which links the loch to the sea. 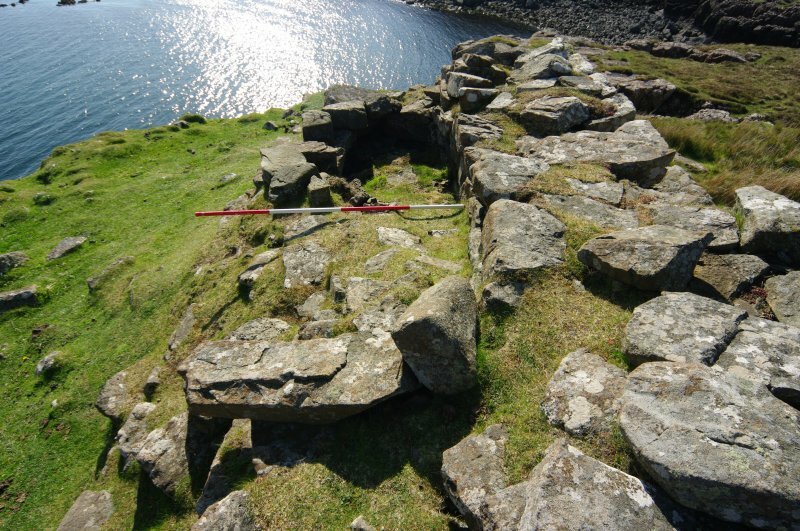 Associated features include two nausts (stone-lined boat docks) which extend from its N side, close to the seaward end, and the tumbled foundations of at least three buildings. 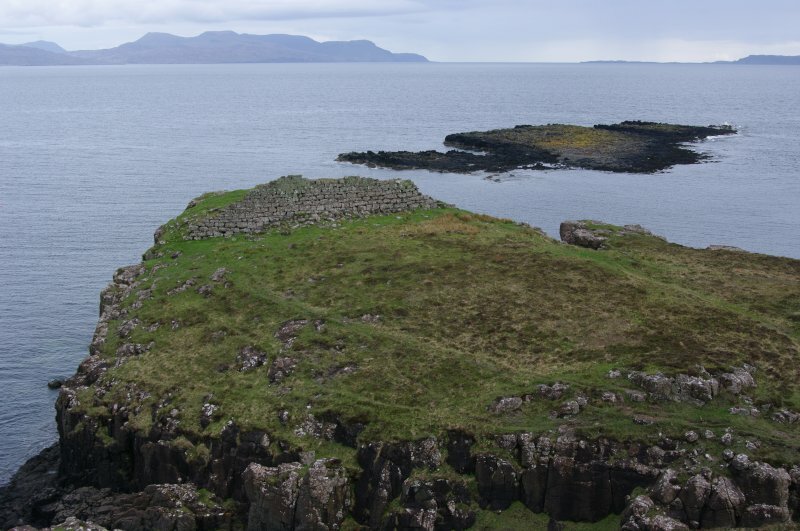 A promontory dun stands on a headland nearby (NG 396 159). 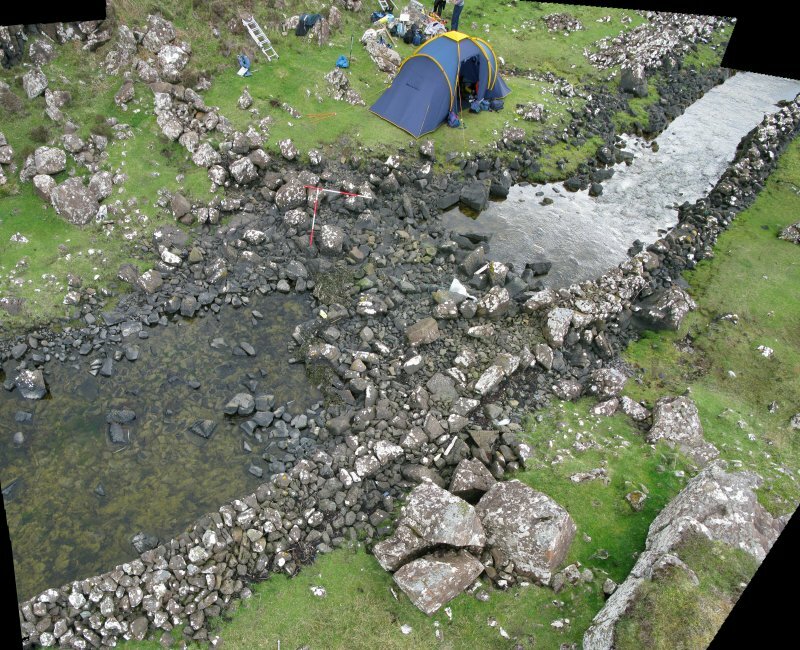 Close to the centre of the canal is a blockage of stones, now tumbled but showing evidence of former structural cohesion. 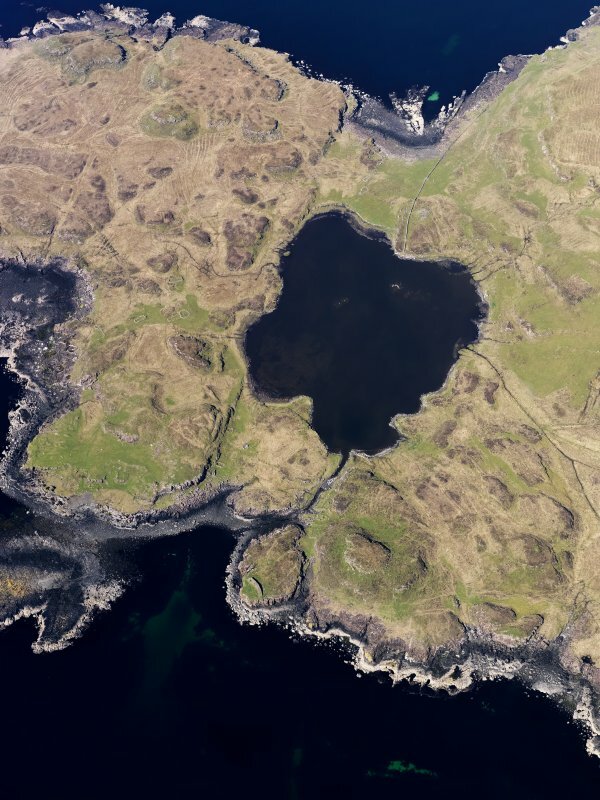 The margin of the loch follows the High Spring Tide contour, though its fill derives mainly from the surrounding catchment and is therefore partly fresh, with seawater entering only during extreme high tides. 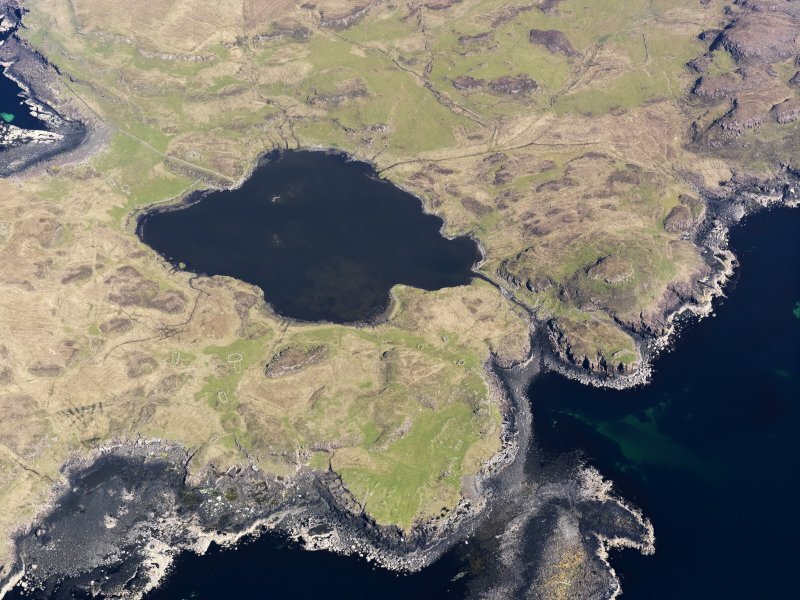 Although water now percolates through the blockage, the level in the loch remains largely constant throughout the tidal cycle. 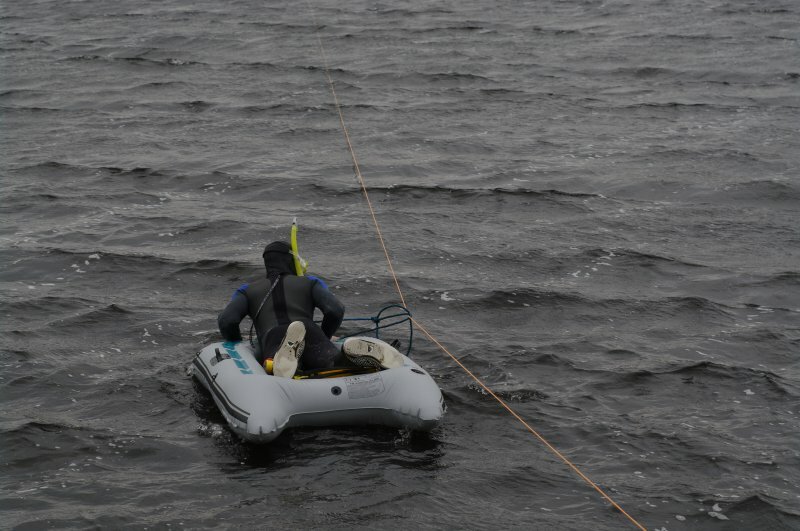 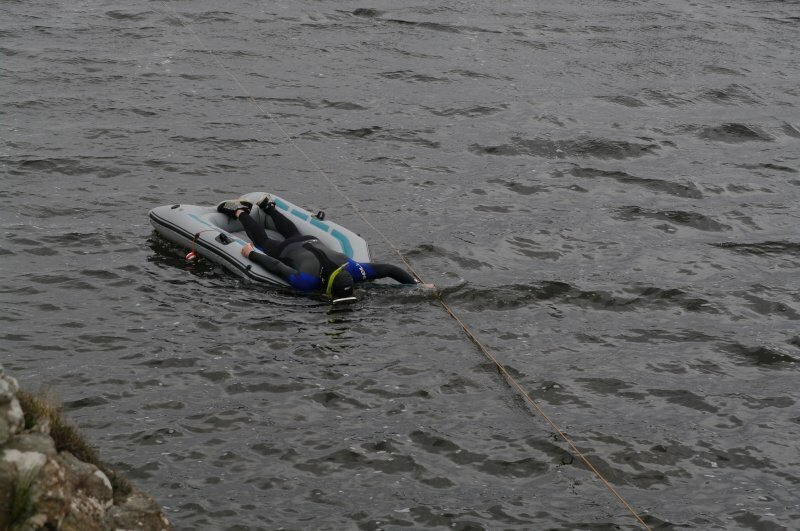 A systematic search of the loch bed, most of which is less than 1.5m deep, was conducted with masks and snorkels. 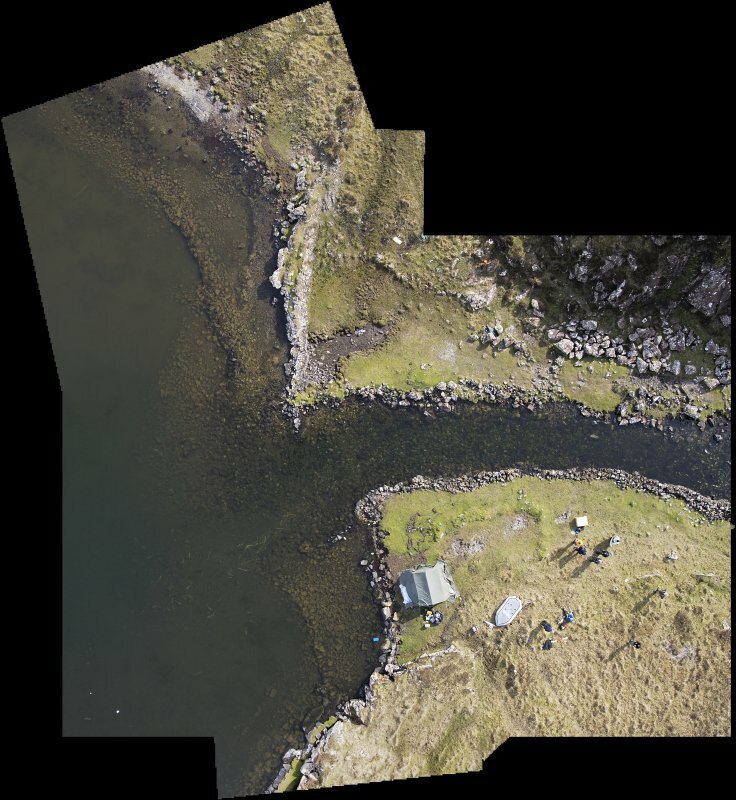 No further boat components were found, but a partly collapsed stone-built quay, now almost completely under water, extends on either side of the canal’s inshore mouth, with a gap in the middle. 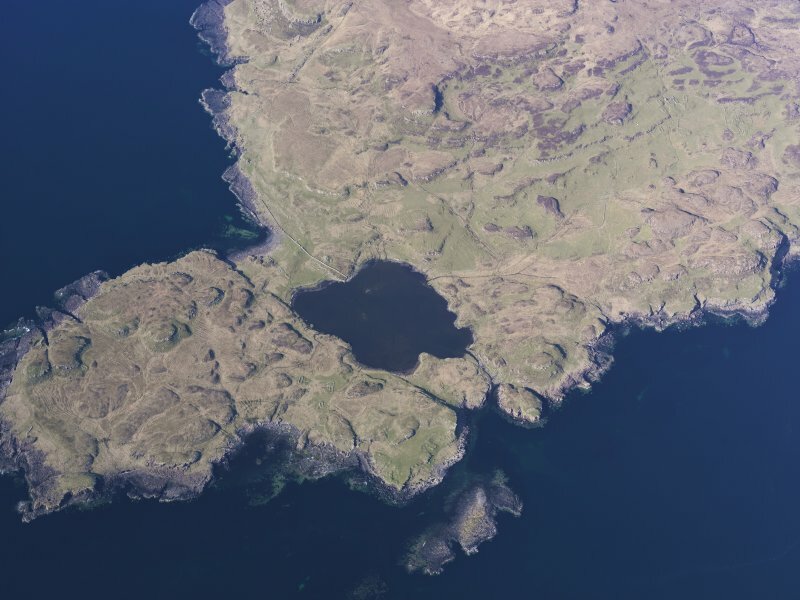 It was surmised that the canal was constructed so that vessels could be brought into and out of the loch, and water levels managed so that while there they would remain afloat throughout the tide, facilitating mooring or use of the quay. 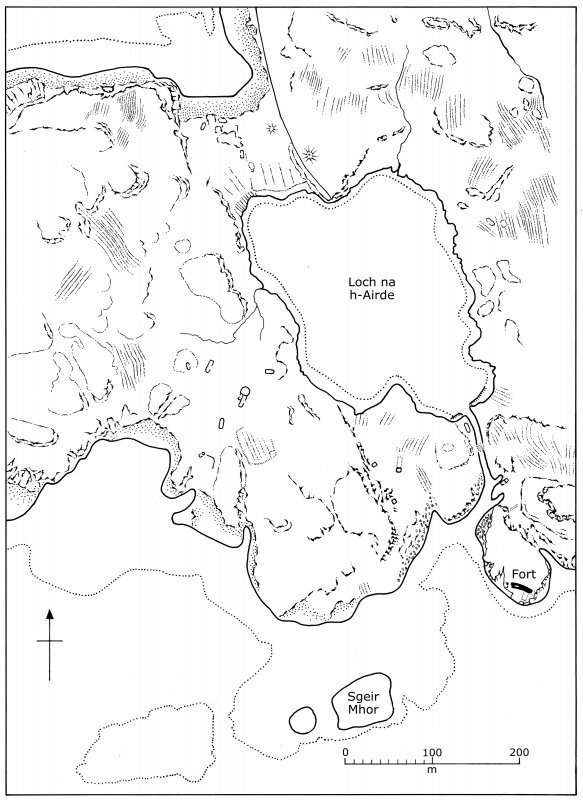 Since the process of bringing vessels into and out of the loch would have been quite complex, it seems likely that the system was intended for the secure over-wintering of craft, or for maintenance and perhaps boatbuilding on the loch’s shores. 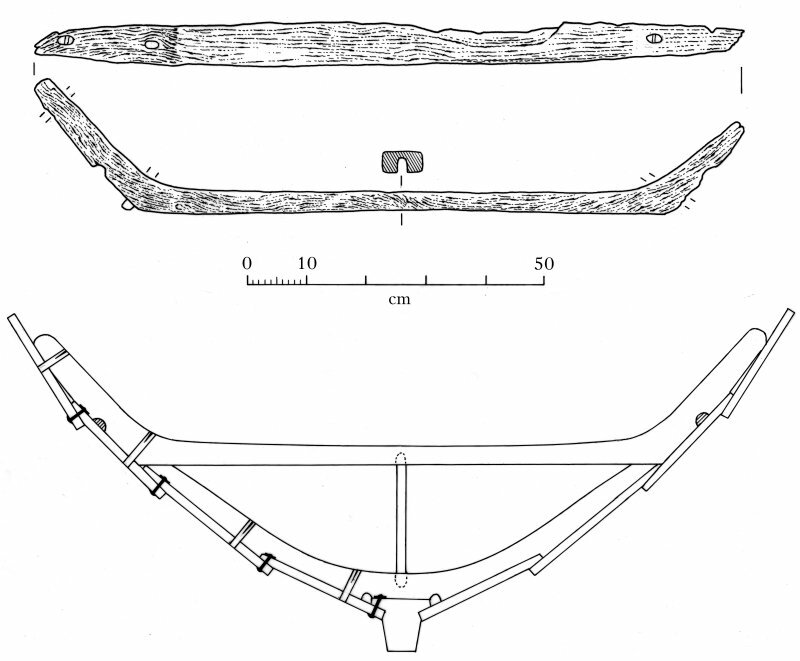 One of the boat timbers found in the loch was probably from a clinker-built four-oared rowing boat c6m long. 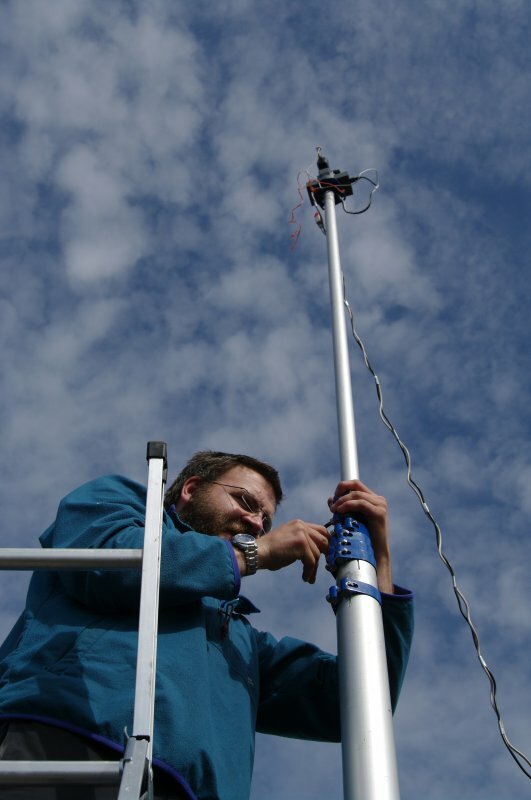 It has been radiocarbon dated to AD c1100. 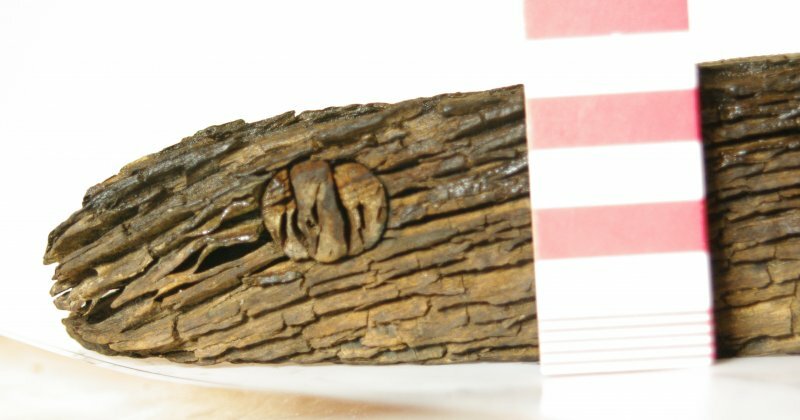 The other undated timber appears to be from a larger sailing vessel in the same tradition, perhaps more than 10m long. 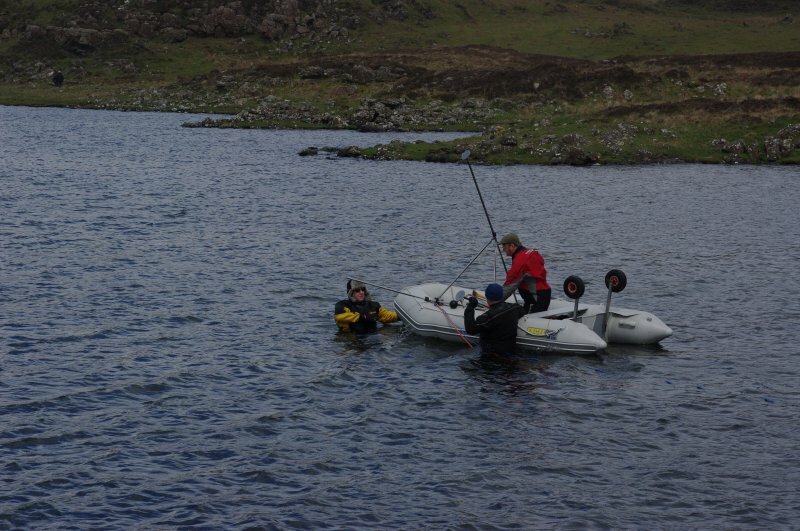 Neither craft could have had a local function in this tiny shallow loch, and were presumably there for safe-keeping or repair, or were being built. 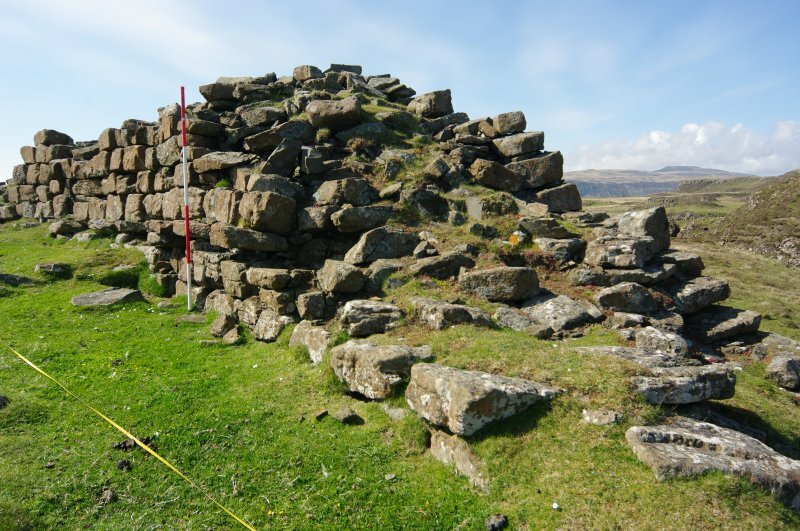 This implies that from at least the early 12th century the canal, blockage, and quay system, or some precursor of them, were in operation. 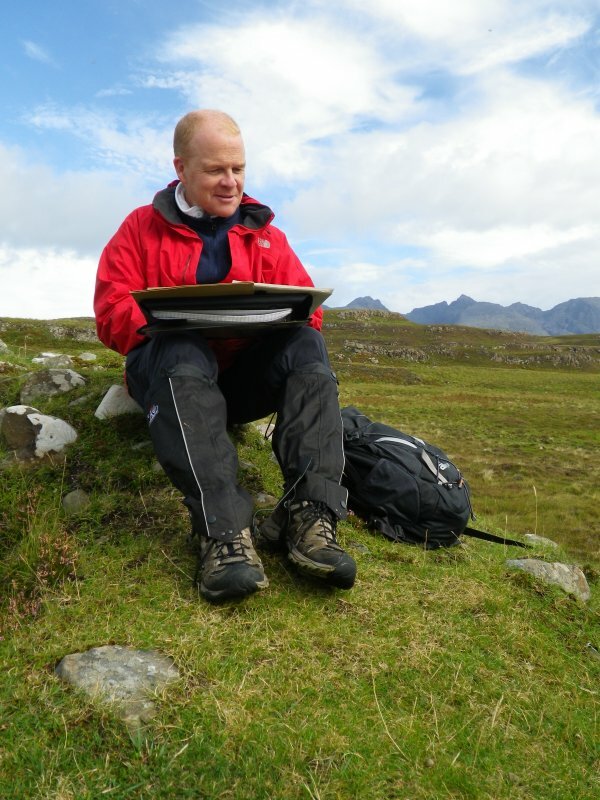 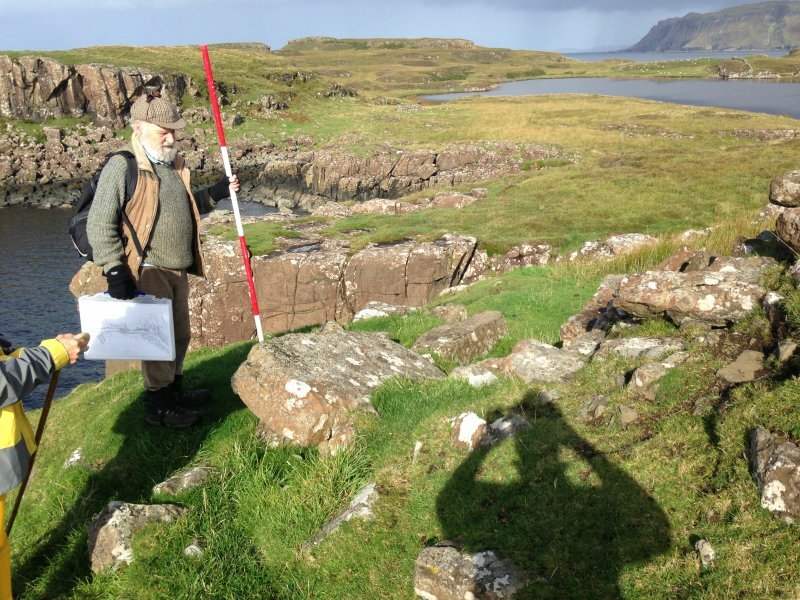 Study of this remarkable maritime landscape is continuing, with research focused on determining the dates, associations and functions of the various features, including the dun. 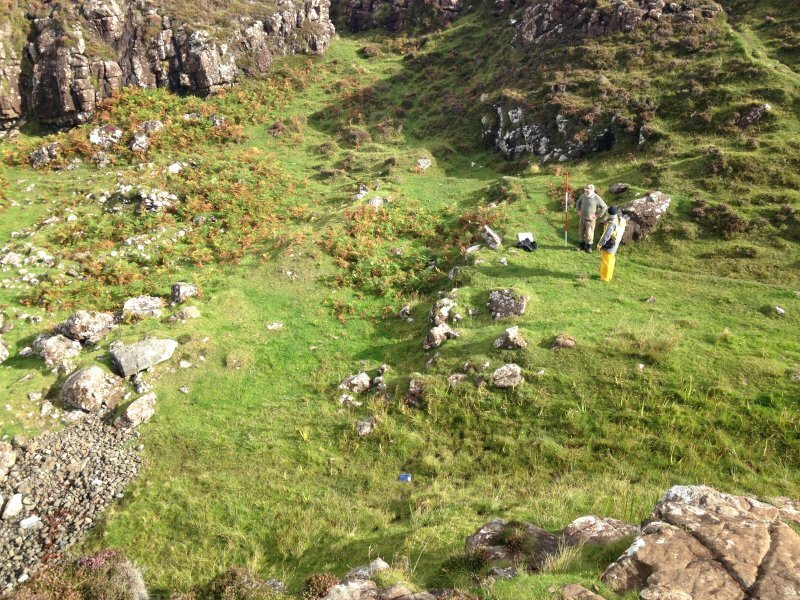 NG 3959 1595 The work on the peninsula, begun in 2009 (DES 2009, 92–93), continued on 15–17 May 2010 with a survey of the galleried dun. 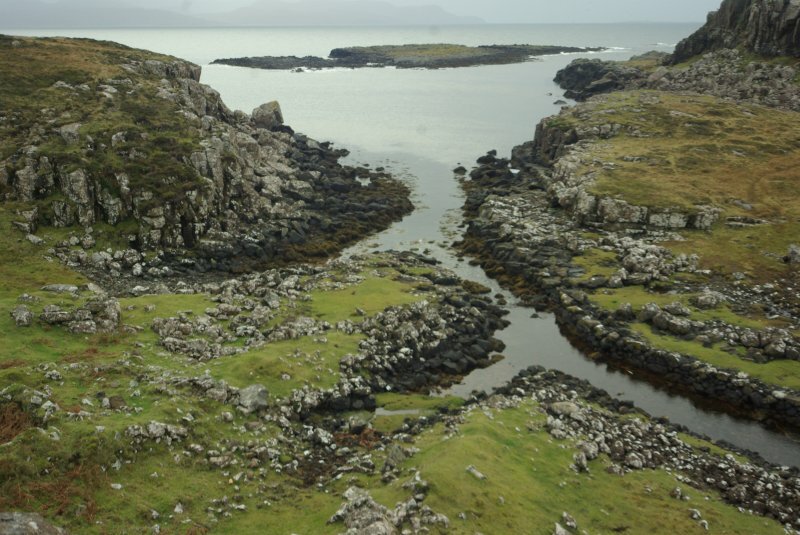 The 30m curving wall, in places up to 5m high, bounds a precipitous rocky headland now c225sqm in extent. 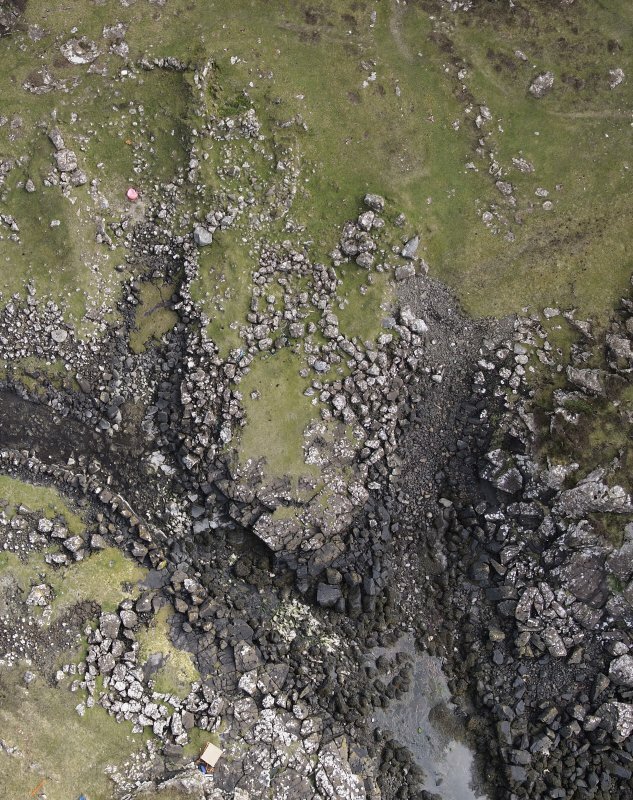 On all three exposed sides there is evidence of major rockfalls on the foreshore below, while both E and W ends are disintegrating over the edge. 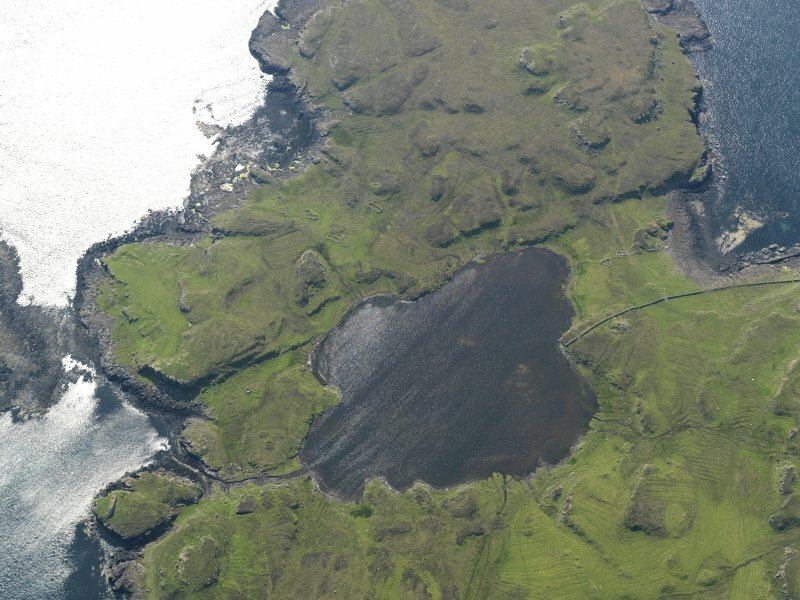 The extent to which these processes have diminished the structure and the promontory beyond is unquantifiable but probably considerable. 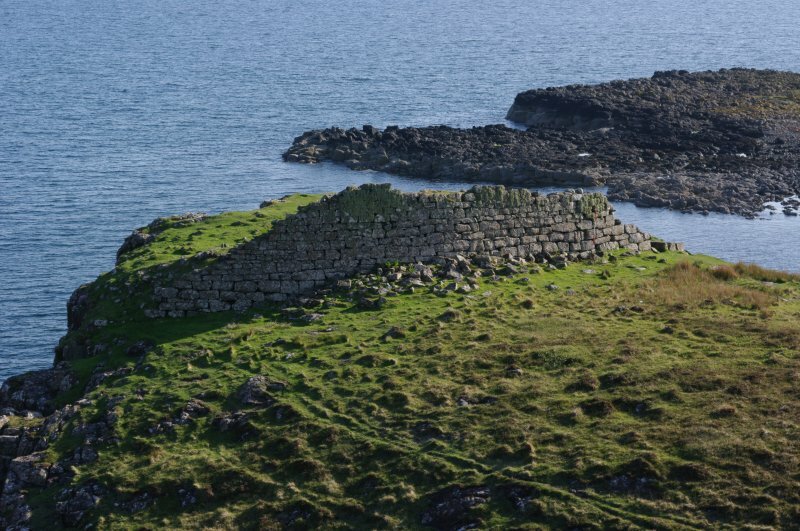 In view of its massive monumental architecture and the probability that the enclosed area was significantly greater than it is today, it is suggested that the monument is best categorised not as a ‘dun’ but as a ‘headland fort’. 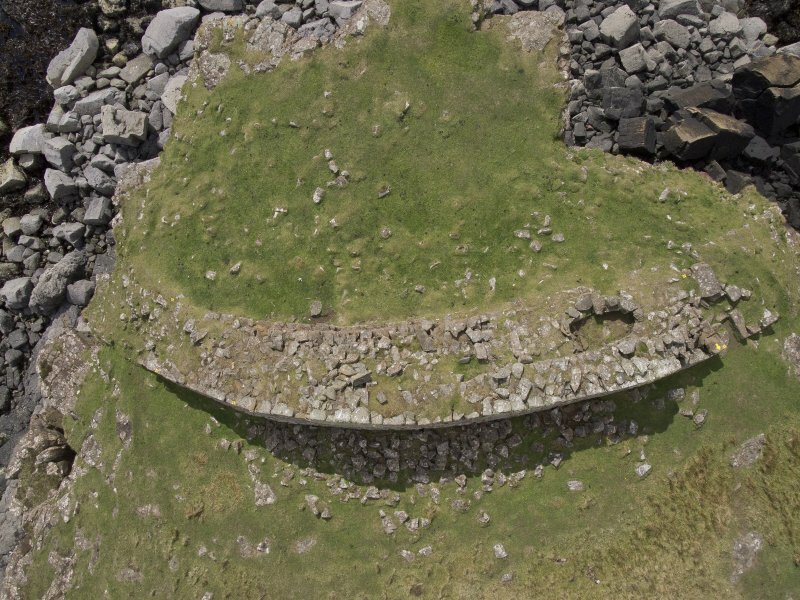 Further examination of the adjacent canal feature revealed a distinctive change of build in the W revetment about half-way along its length, at NG 3945 1600. 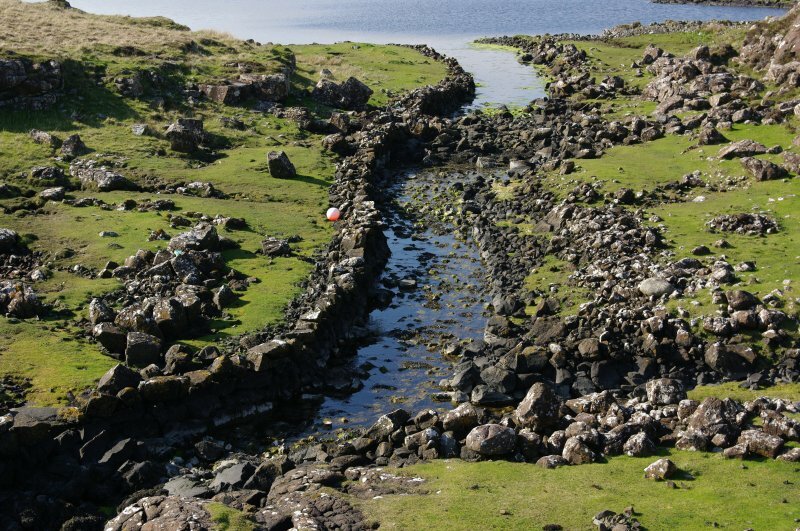 The seaward sector is built of long slabs laid horizontally while the upper sector leading into the loch is of smaller rounded rubble. 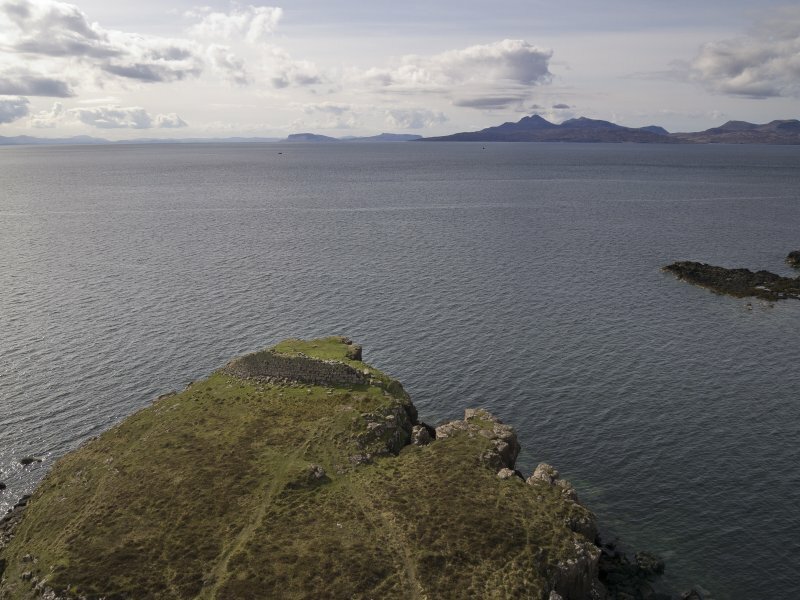 This suggests two phases, the first linking the two boat nausts below the fort to the sea and the second continuing the canal into the loch. 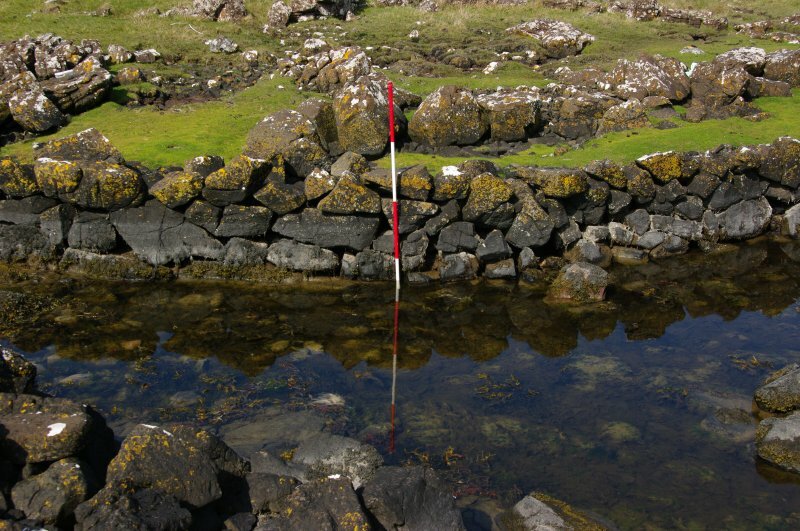 Although the stones of the fort wall are similar to those of the lower canal revetment, they do not appear to have been robbed. 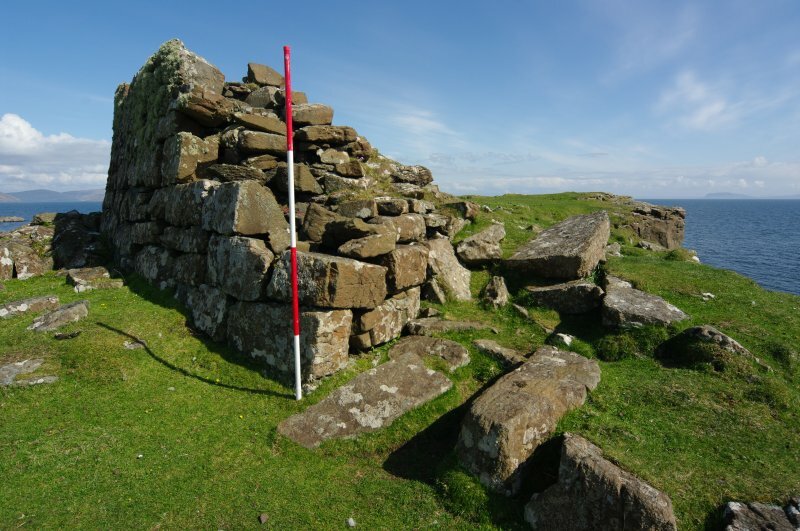 This suggests either that the fort, lower canal, and nausts are contemporary, or (perhaps more probably) that when the latter two features were built an already existing fort was retained as part of the overall scheme. 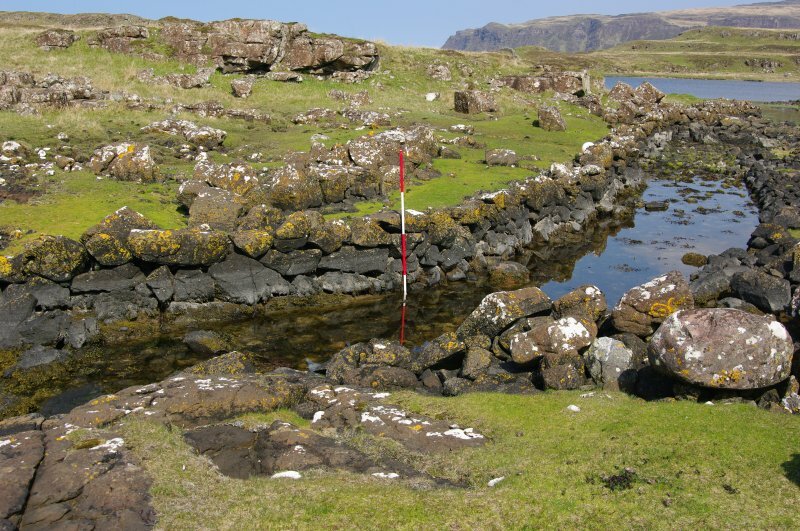 A terminus post quem for the upper canal is provided by a boat timber from the loch which has been radiocarbon dated to AD c1100. 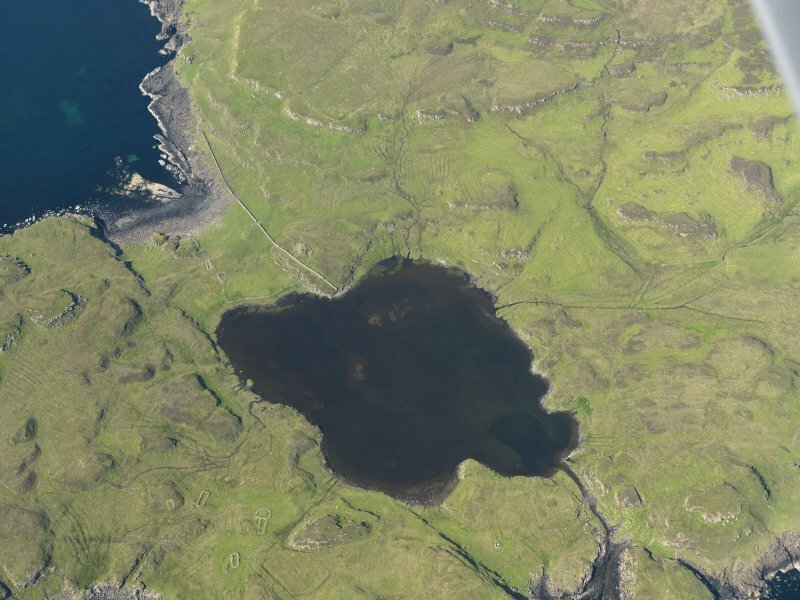 Reached only by a solitary track, Loch na h-Aide (possibly, ‘The Loch of the Point’) is situated within a complex landscape of both prehistoric and historic remains, that includes a scheduled chambered cairn, a cliff-top dun, a number of hut circles and two pre-improvement townships with their associated field systems. 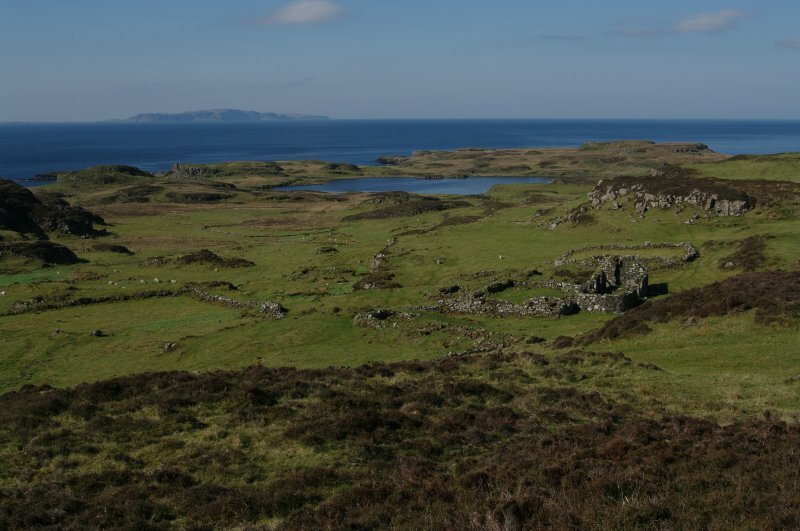 The area was occupied until the 1860’s when, after thousands of years of possibly continuous use, the peninsular was finally abandoned. 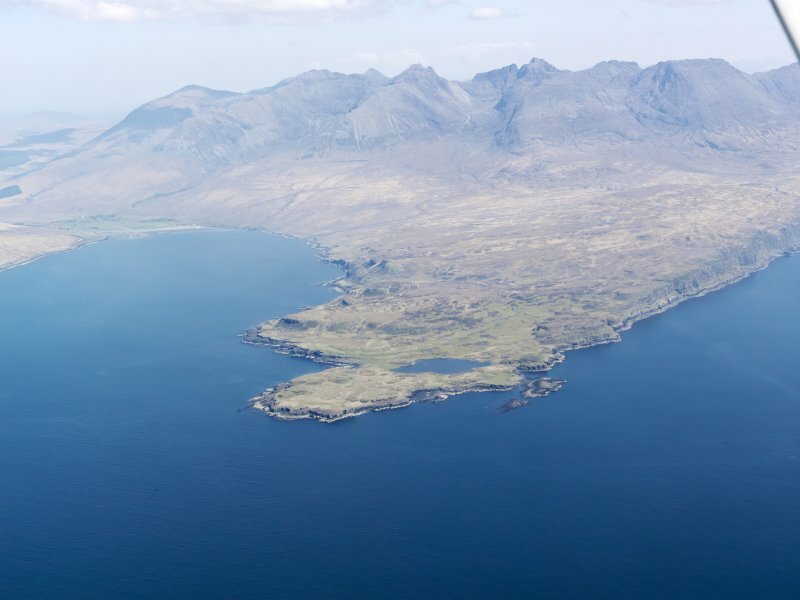 To the modern eye this area fronting the Cuillin Mountains is absolutely desolate, but our judgement is clouded by our dependence upon modern transport links. 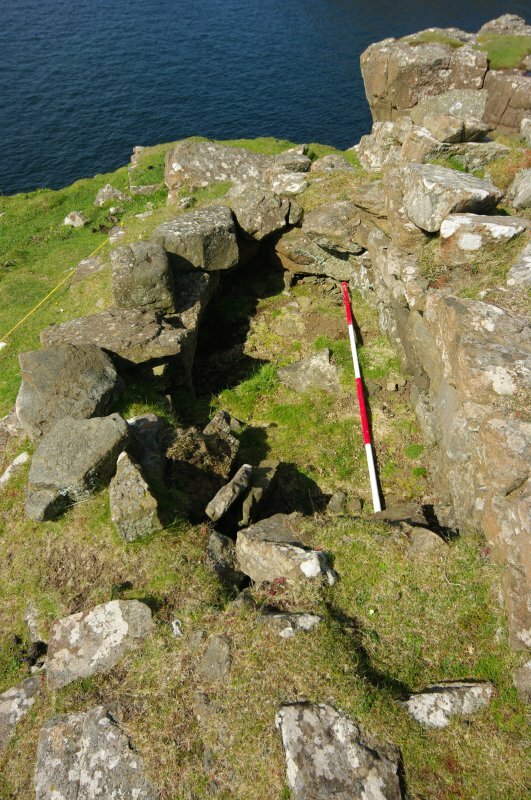 The communities who lived here were evidently quite comfortable in this environment and some were also masters of the Atlantic seaways. 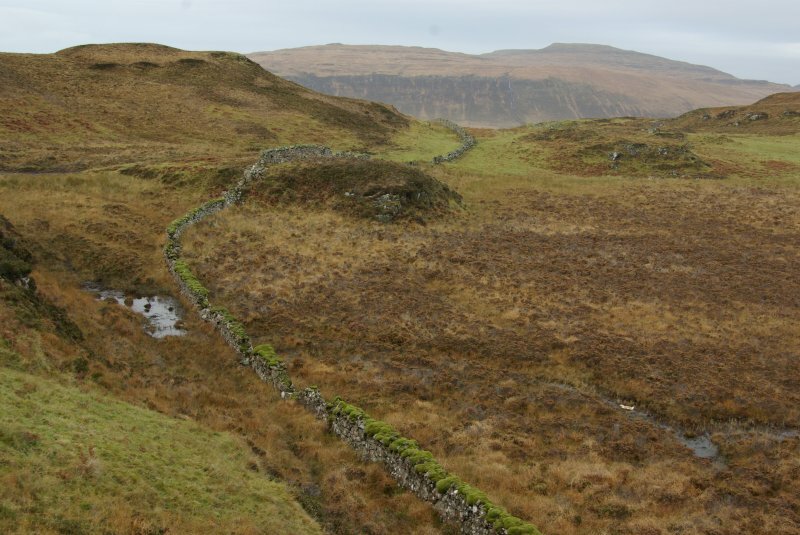 On the south side of Loch na h-Airde there was once a small stream that ran from the freshwater lochen to the open sea. 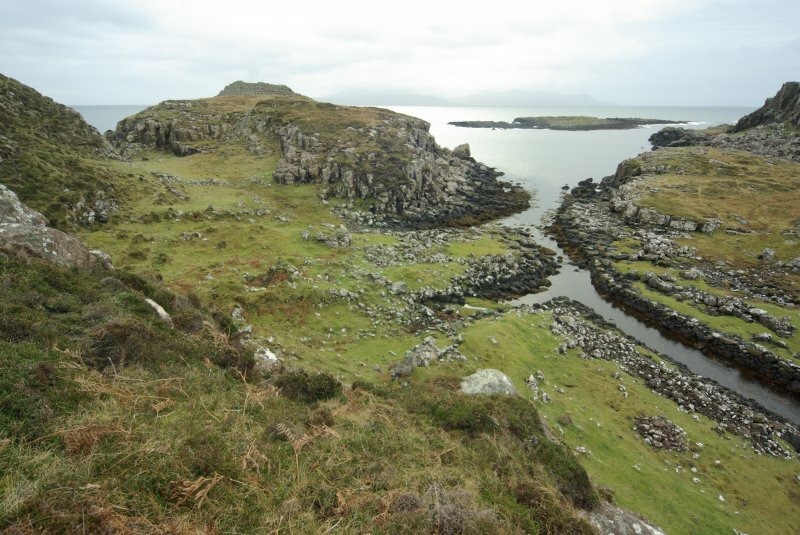 A naturally sheltered cove below the dun would have offered protection to a vessel where this stream reaches the sea, but at some point (perhaps about a thousand years ago) the stream was converted into a canal to allow sea-faring vessels to enter the lochen simply by means of the rising tide. 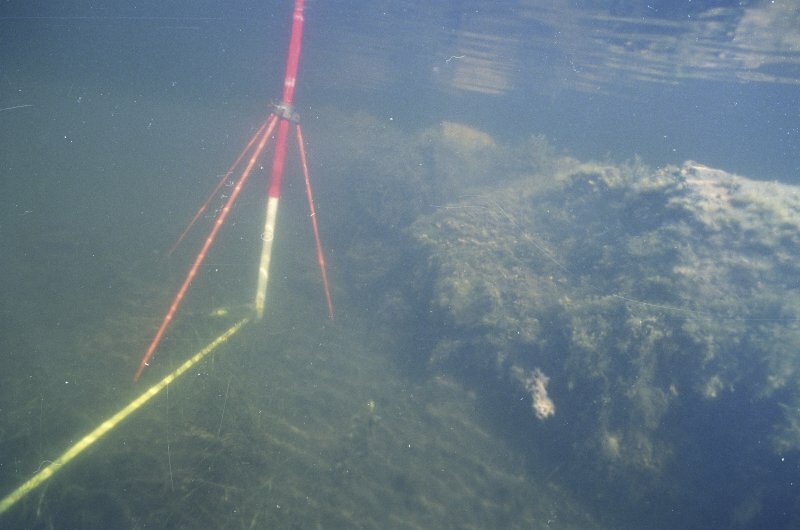 The canal, which is roughly 120m long, 3.5m wide and at high water about 0.5m deep, includes in its lower section two stone-lined docks and their accompanying nausts - both allowing vessels to be hauled out of the water. 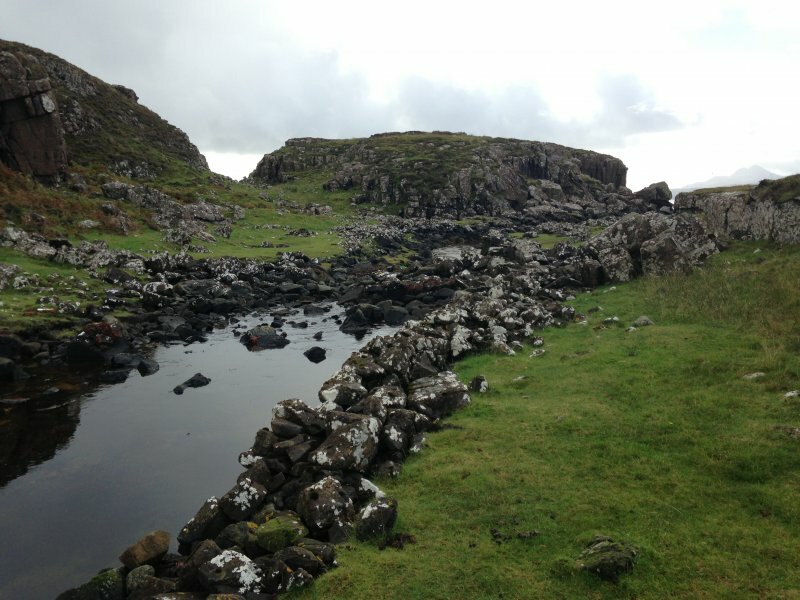 The upper section of the canal, which is neatly lined with stone revetments is blocked by a mass of boulders. 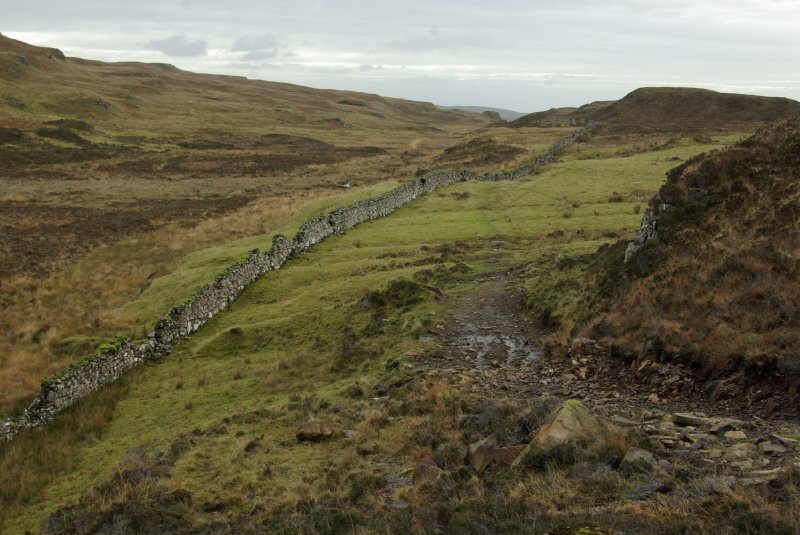 This essentially destroyed the function of the canal, although it may well have fallen from use a long time before. 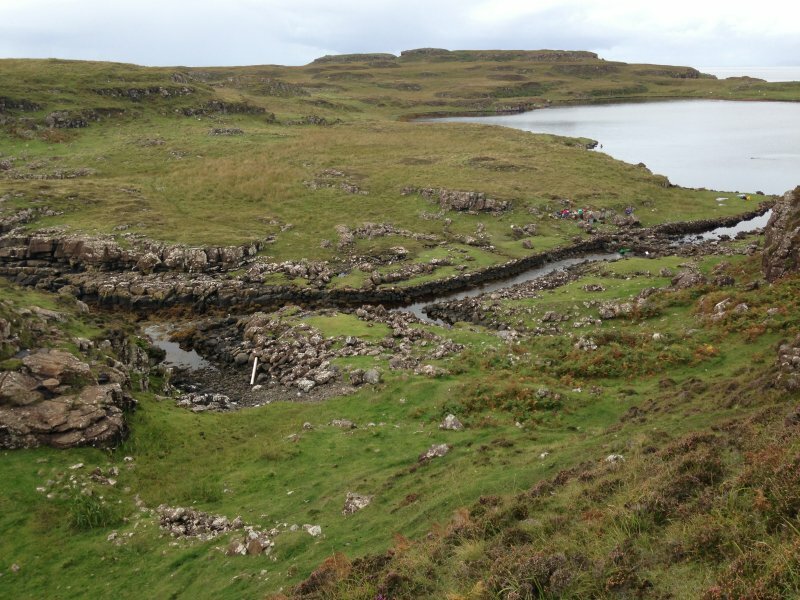 It is possible that the vessels that availed themselves of this waterway were similar to birlinns. 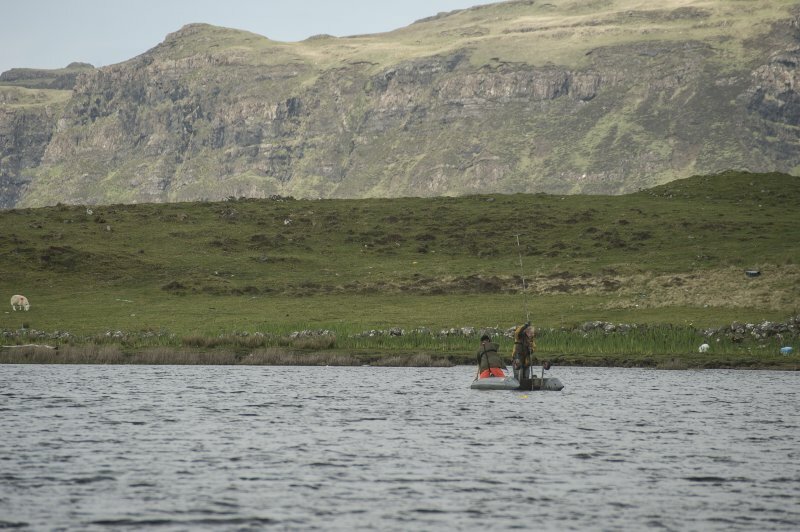 These were a oak-built craft propelled by sail and oar that are known to have been in use in the West Highlands of Scotland from at least the 12th century AD. 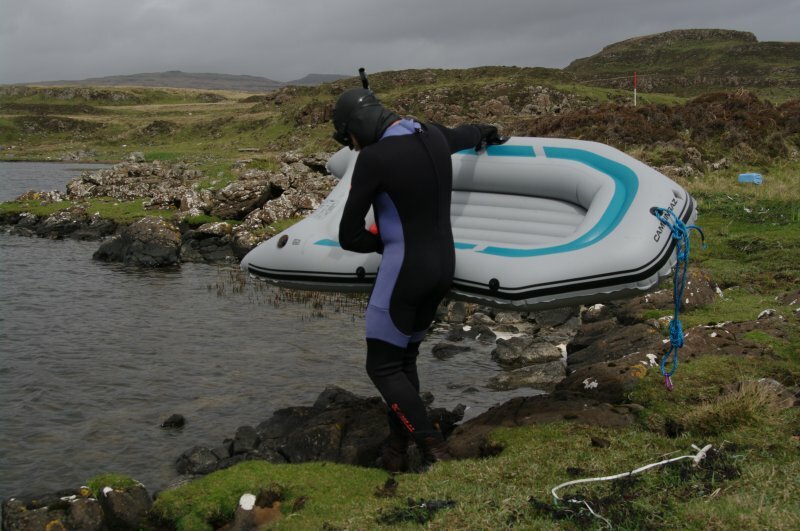 The true ingenuity of the canal is its relationship with the tides. 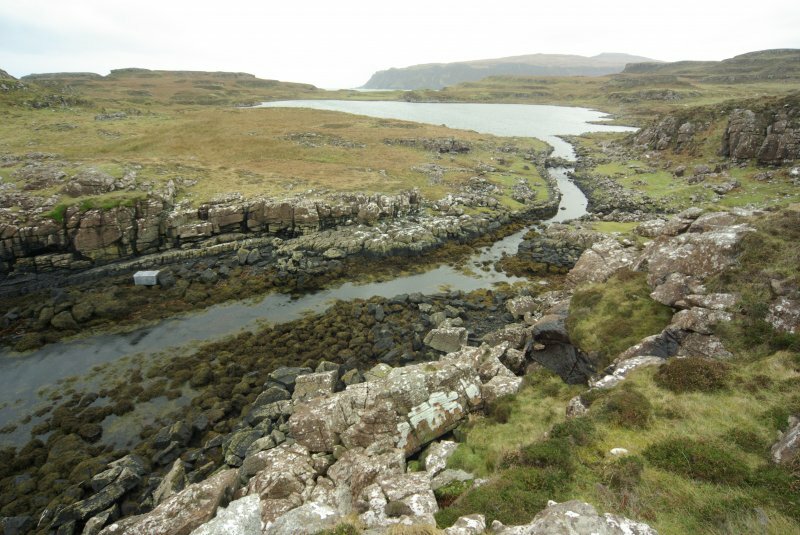 At low tide the canal is impassable and only a small stream links the loch to the ocean. 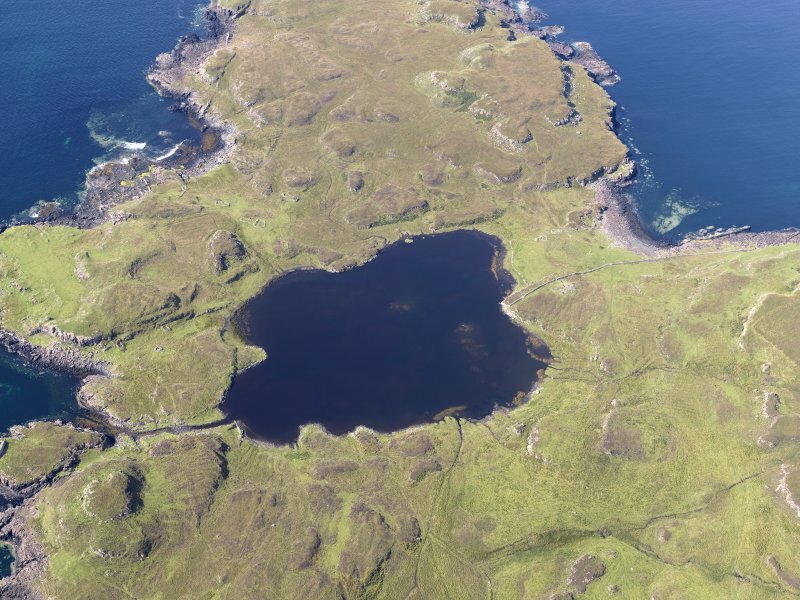 However, when the tide rises about 1.5m, the seawater swells upwards and floods into the lochen; and for a short period around high tide, vessels could safely enter the lochen. 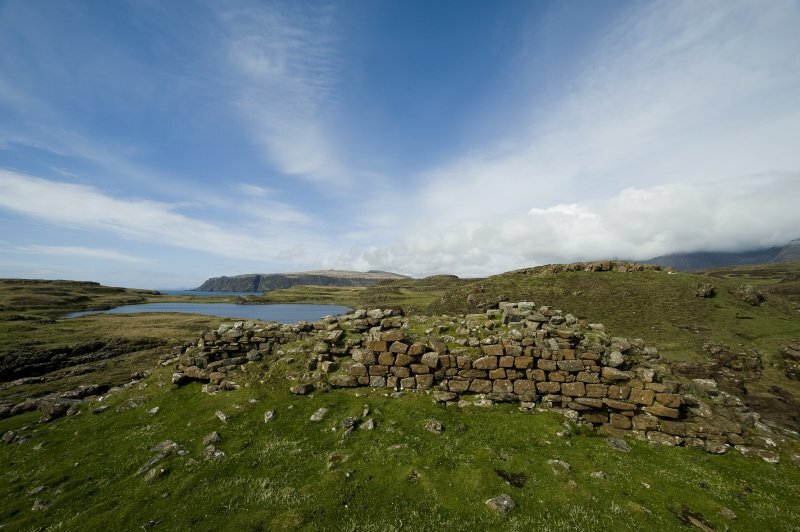 This remarkable feat of engineering is a rare survivor and if similar constructions once existed elsewhere, it is likely that they have been built over. 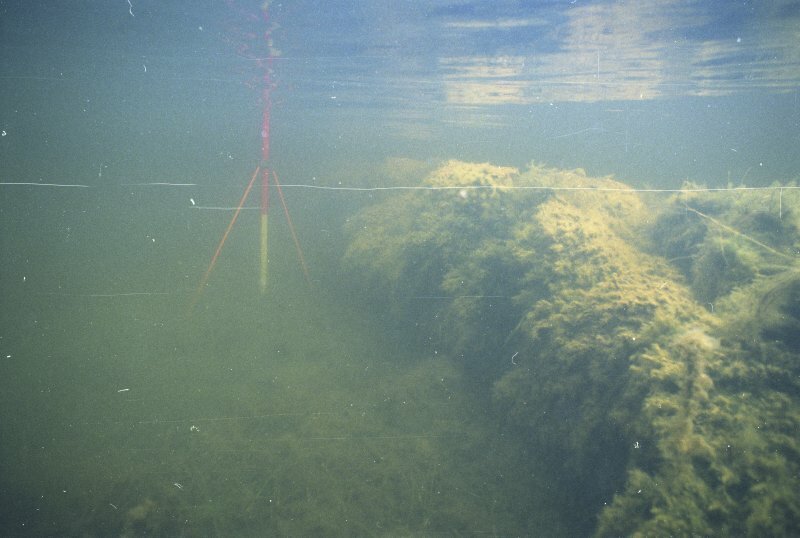 Since the character of the canal was recognised by Roger Miket in the late 1980s, it has been the subject of a number of investigations, including detailed mapping and aerial photography; while the lochen, itself, has been explored underwater. 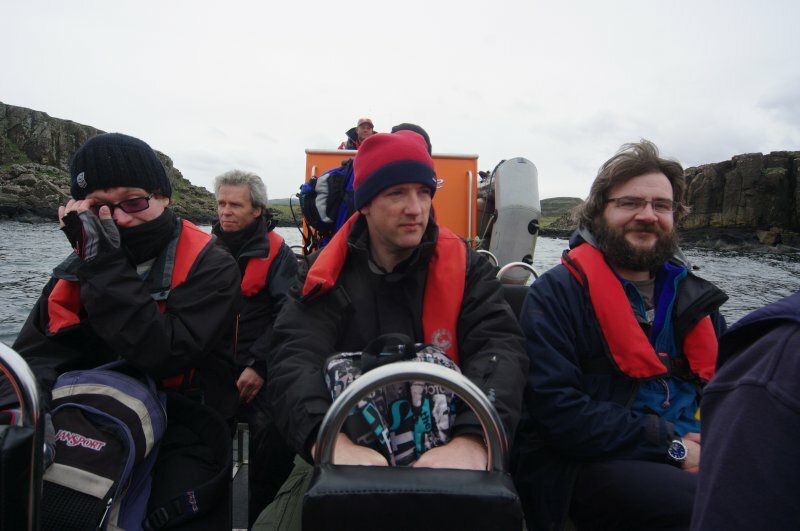 The driving force behind the most recent episode of research has been Colin and Paula Martin, but exploration by Dr David MacFayden at the northern end of the loch in 2000 AD revealed an oak boat-timber that has since been radiocarbon dated to around 1100 AD. 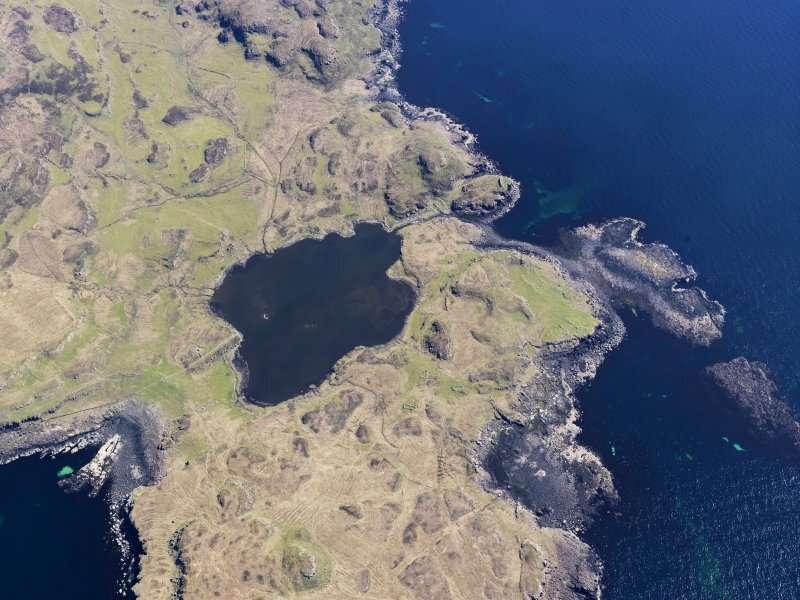 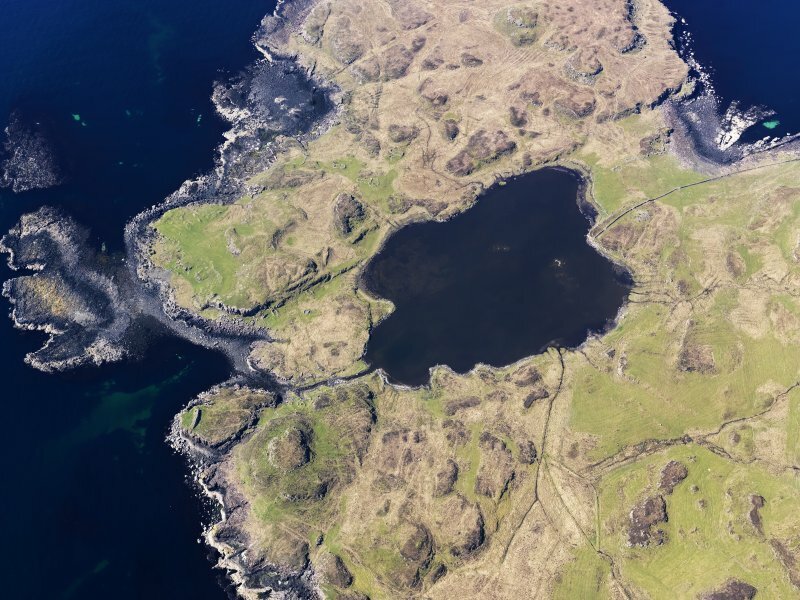 This raises questions about Viking and Norse activity in the area, or whether these works were undertaken in the equally poorly documented era that led to the rise of the Lordship of the Isles. 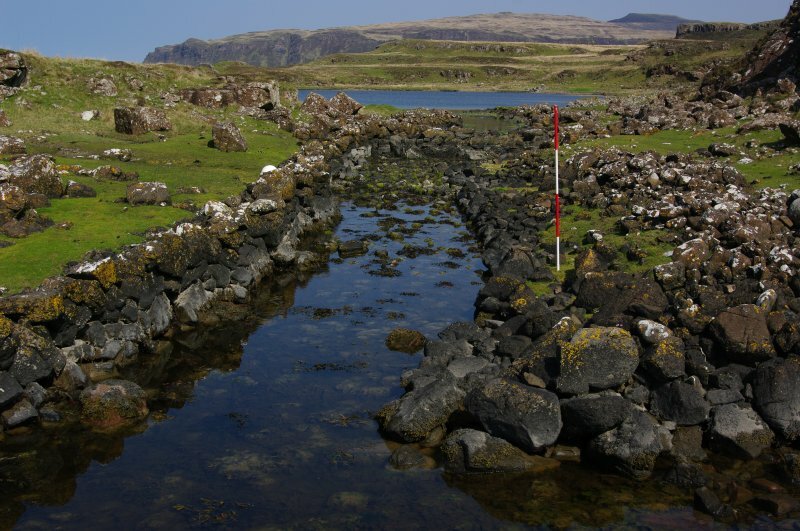 The ebb and flow of the water in the canal is described by those who have witnessed it as an amazing phenomenon. 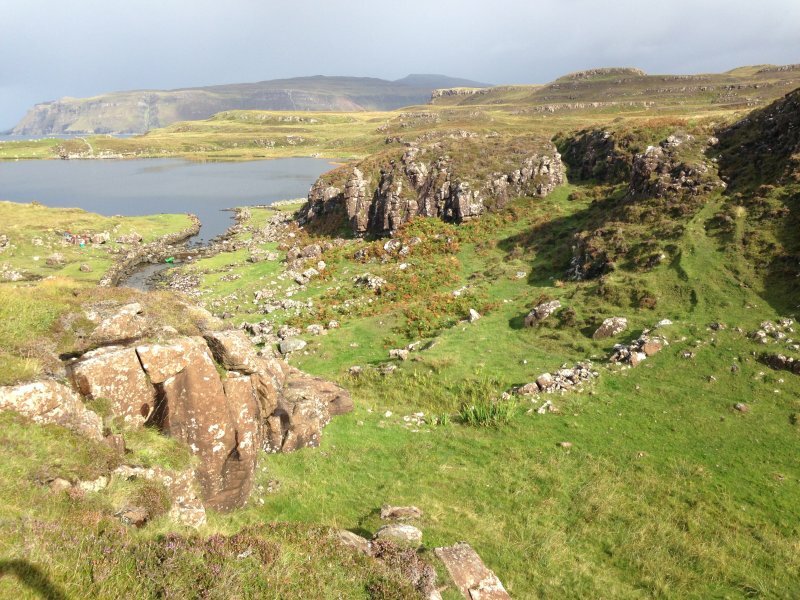 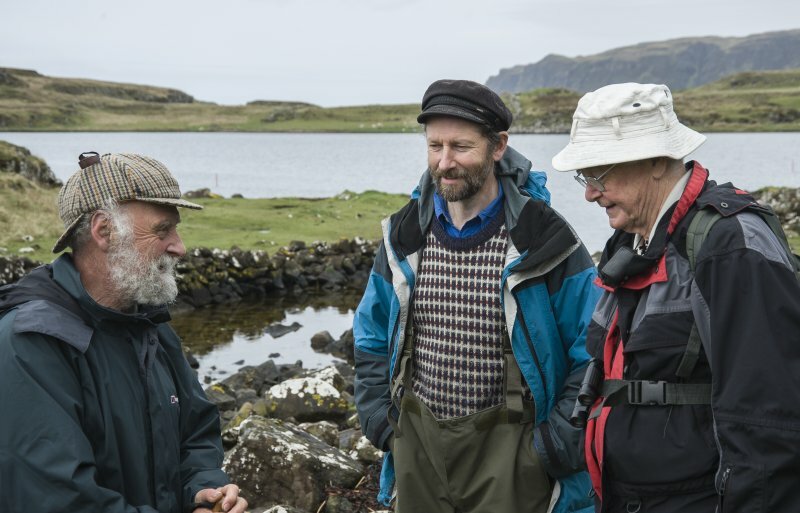 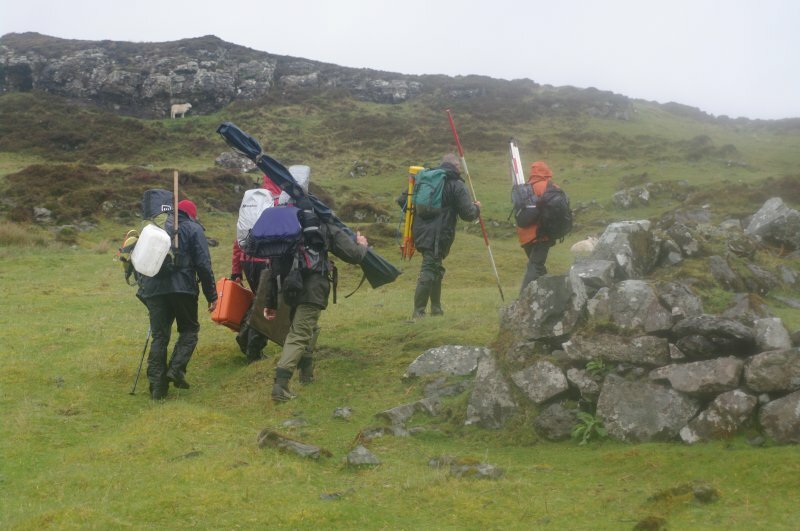 So, if you are one of the thousands of visitors who flock to Isle of Skye every year, why not make the trek out to Rubh' an Dunain? 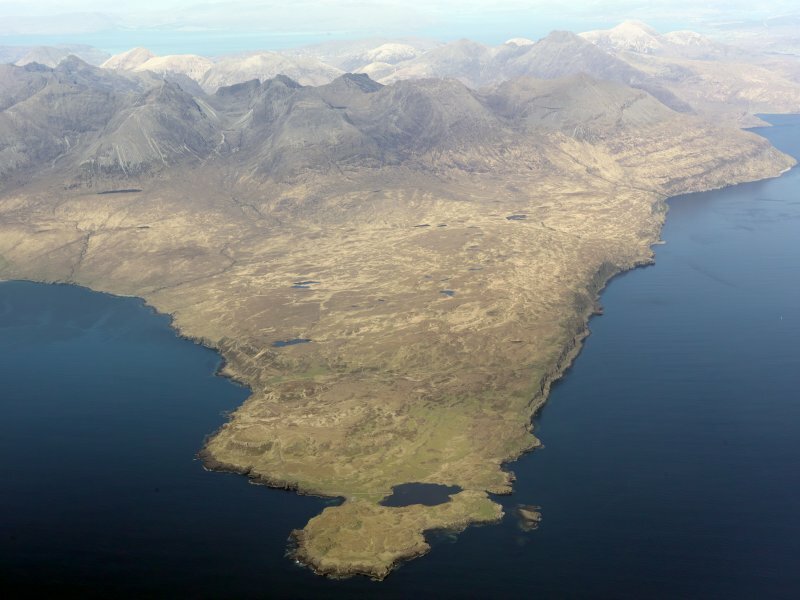 Moreover, unlike the famous fairy pools near Glenbrittle, it is likely that you will have this remarkable site all to yourself.